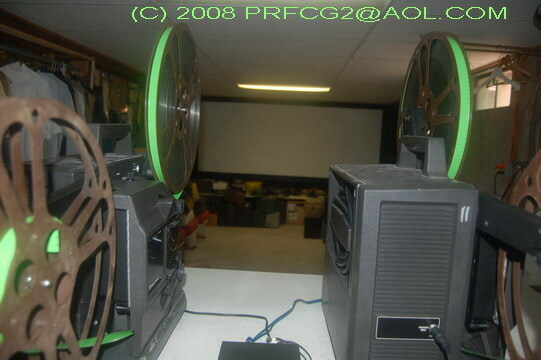 This is topic Your Screening Room Pictures. in forum 8mm Forum at 8mm Forum. 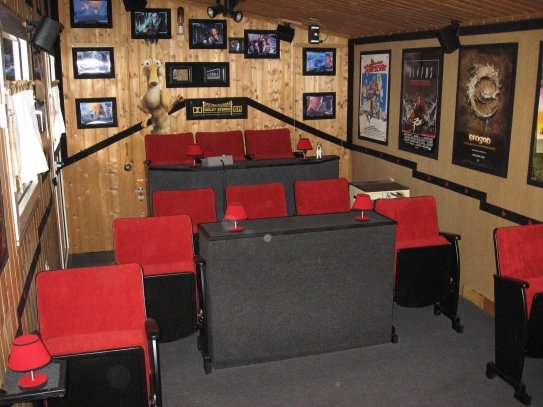 As Mike said in another thread, all the pictures of peoples screening rooms are all within various other threads. Lets get them all in one place. 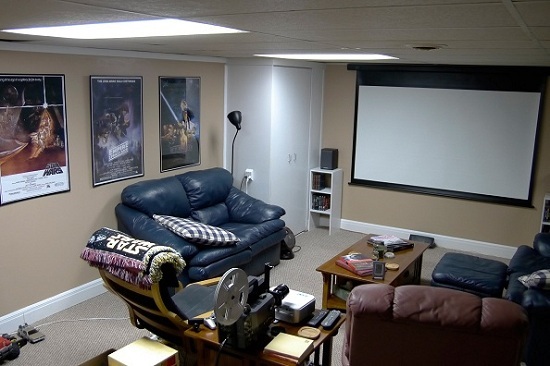 Please post all you pictures of screening rooms into this thread to make it easier for people to find them. Who is going to start us off? Thanks Paul for getting the thread started. Like the 9.5. 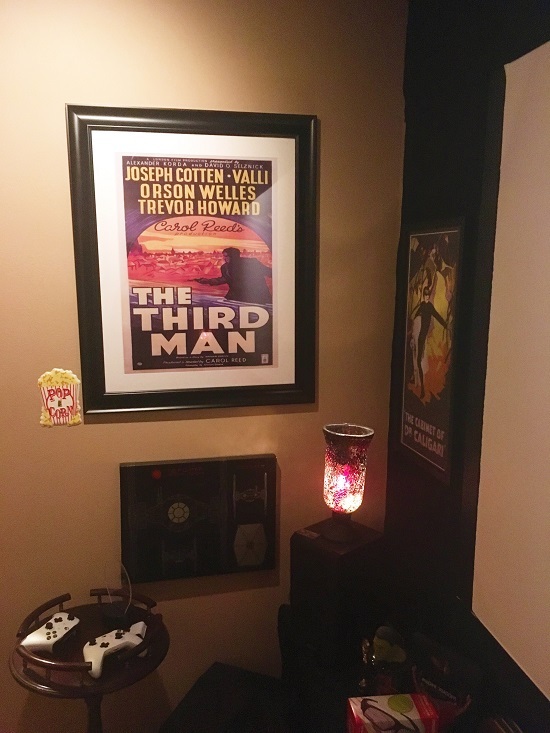 Many thanks for setting up this thread, and thanks Paul and Jan for being the first to post your screening room pictures here, Paul I like the additional shot of the "movie display cabinet" that's a nice touch. It'd be great to see more screening rooms on this thread now as it is really putting me in the mood to get mine underway! hey Jan, great stuff! American style! Looks just like my place! Really? Well, how about some pick-sures, then? Great idea not sure how to move photos from place to another without mucking things up. Kev you are more than welcome to alter, edit anything I have submitted and add it to this topic oh how did you get on with Cinema Paradiso!. 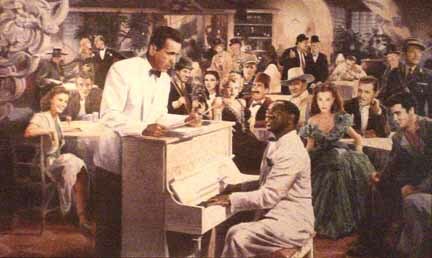 This one is called appropriately 'Play it Again' and shows Bogey and a host of stars in Ricks Cafe. I have this located on the wall where the screen rolls down- it is the perfect picture for that location. Thanks for your help. I gave it a go but havent been successful so far I will give it another try later this week. much appreciated. 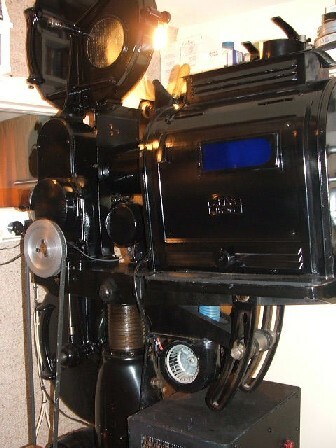 Ernemann 2 projector "The Big Beasty"
The Projection Box "The engine room"
type of lens is it? Thanks Jan and Michael here is another photo I took last night this time with the 16mm I made another bracket for the B/H ran Star Wars with the screen adjusted to 12ft looked great Michael I have a photo and description of the 35mm lens in the Yak section under the topic Home Cinema thanks again. I reckon I have the tiniest theatre,a two-seater! I like to be surrounded by shelves of film and old toy projectors. great stuff gentlemen.and a hellva lot better than mine. looking at those magnifcent pictuers.brillant.andy. 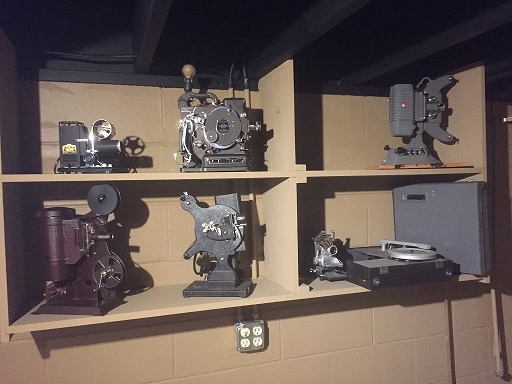 Your projector collection is awesome! What is that double-eyed contraption in the bottom left corner of the bottom picture? WOW!!! 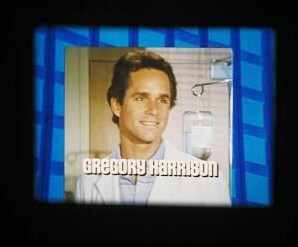 That is unbelievable - it's not a screening room, it's a LIVING MUSEUM! I hope you're teaching your family members and/or friends to take good care of this stuff in case the time ever comes where you can't. It is simply stunning, I could spend hours locked inside that room just gazing at every single thing. I think we should organize a Forum group tour to visit Trev's house in NZ. By "visit," do you mean "raid?" with the Mickey Mouse label? and off to the side. Good morning chaps!It is sunny but cool here in Auckland! Paul,the projector you refer to is an Uncle Sam Durotone toy from the 1930s.The two-phase animation film strip(actually rather translucent paper)moves horizontally as you crank the machine.The upper and lower images project alternately and overlap-so a primitive form of animation is achieved.Also,a shutter obscures the image from the upper then lower lens alternatively, to smooth the picture change. It works ok!The coupled record player must be the lowest fidelity gadget ever devised! 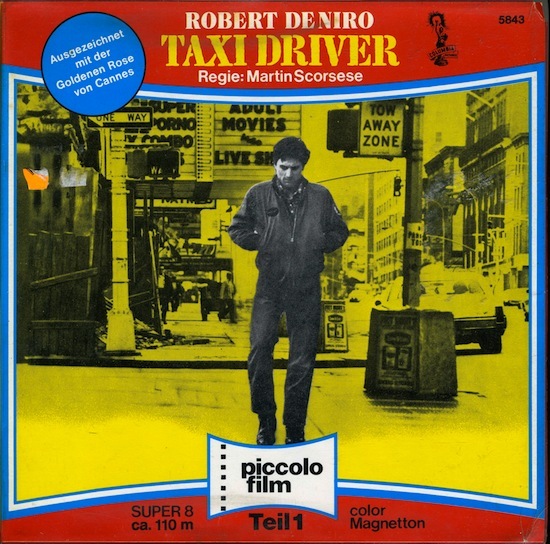 !The "talkie" films were sold with a record. You would have been a lucky kid to get one of these I reckon. I don't have a Vitaphone Michael,sorry.The Mickey Mouse Talkie-Jecktor came out in 1935. It is a rather grand affair.It is clockwork and works in a similar fashion to the Uncle Sam...however,sound is quite a bit better and lap dissolve shutters yeild quite a good movie picture.Not having to crank is a real bonus. THe MM is a rather substantial item.Amazingly it sold for $1.98 in 1935! 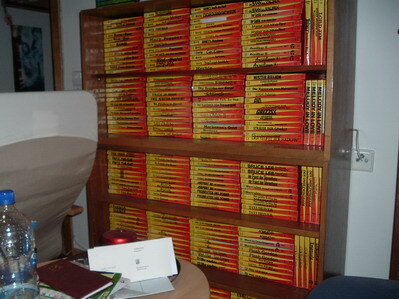 Jan,sorry to say no one is interested in my "addiction".I can see it all going out on the side of the road some day! !Suppose I could offer it to a museum? ?But NOT YET! P.S.For a good look at toy projectors from everywhere put "Mettavantproject"into Google. Also,for cine everything(!) type in, "cinematographica" for a site you will revisit many times! All of those pictures are excellent.I'm green with envy.andy. 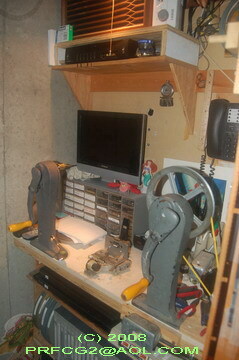 This link is mainly the Towers installed into my tiny booth. Currently, this is the setup. 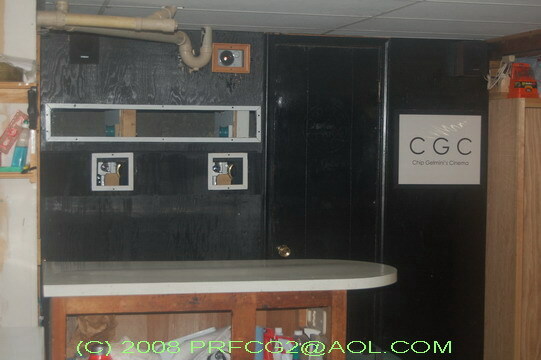 This next link, is older pics of the booth, but with some shots of the basement cinema as well. 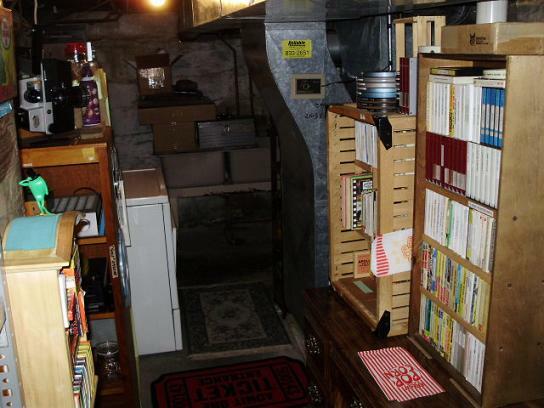 The basement really has not changed much. 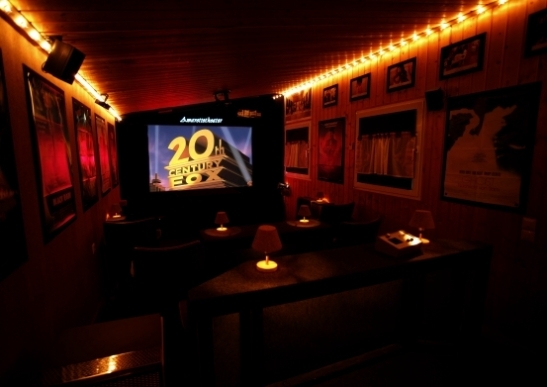 Seems like it's time for me to do another photo shoot of the basement cinema, in due time I will try again. Tom, don't be embarrased. I think everyone is just curious as to what each other uses as a screening area. 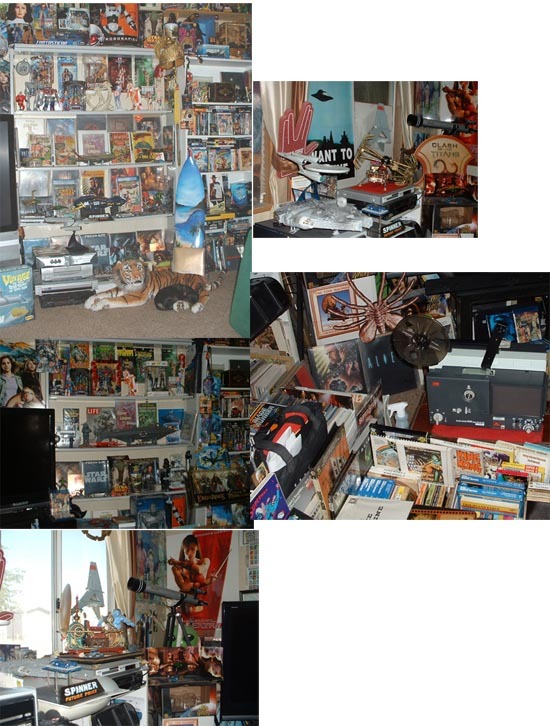 The elaborate ones are great, but I also like to see what people have in their apartments, basements, garages, etc. Seeing the collectables is a interesting too. With all that weaponry no will attempt to hiest any of Trevs films. Then there is my cat Sweetums standing sentry over my screening room. I like this thread so we can learn from other and also give a comment. 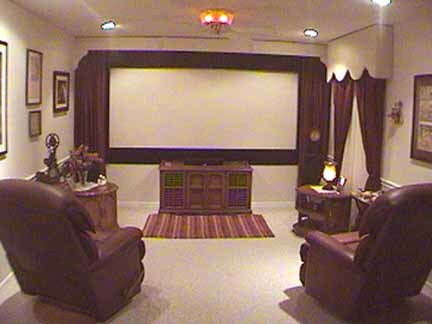 Would be possible under this thread ("screening room") you two guys create different sub-thread (folder) under the owner of the screening romm, e.g. 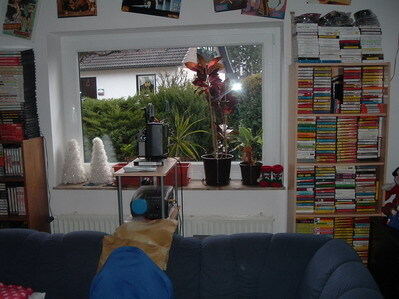 Kevin's room, Winbert's room etc. By having this way, so every body can give a comment to a particular room in one (sub) thread instead of what we have now. In other way too, someone who just register in this forum can still submit his comment to the respective rooms, not only to the last picture, like the trend we see now. Unfortunately I dont this particular software will allow this Its a good idea however. I will have a word with Brad. You two guys as the moderator have a right to move the post, don't you? And you two guys too have a right to delete a post. What yu need to do now, I think, move this sticky post to forum menu, and name it as Jan's idea. Then make new post according to the respective owner and delete all posts that does not relate to the screening room (like my two posts here). Having this way, the other members who stick posting in 16mm only will also be encouraged to contribute. 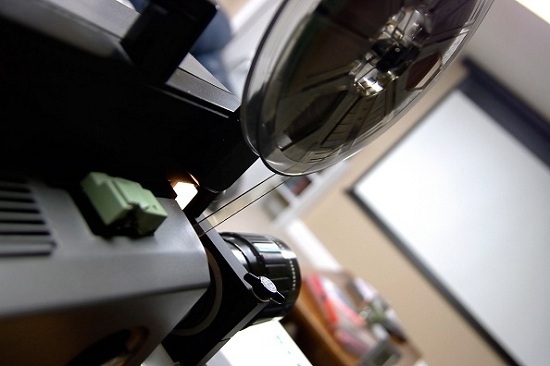 The screening room does not matter 8mm or 16mm, does it? Did you see what did I mean? This thread become so silent...since other members (esp. the new one) tend not to comment on the first HTs appear, since people will only focus on the last post. This will be diferent if each HT stands on different thread. Nice idea, Winbert. We'll see what we can do. I'm also thinking we should keep our sticky posts to a minimum. The eyes kind of glaze over the top. Douglas, the 550 pixel limit is due to formatting of the forum and how the software handles people with lower resolution monitors. We are currently considering a foolproof method of forcing the server to resize pictures, but also be able to display the pictures full sized if clicked on. Not sure how feasible this is, but we'll see how it goes. 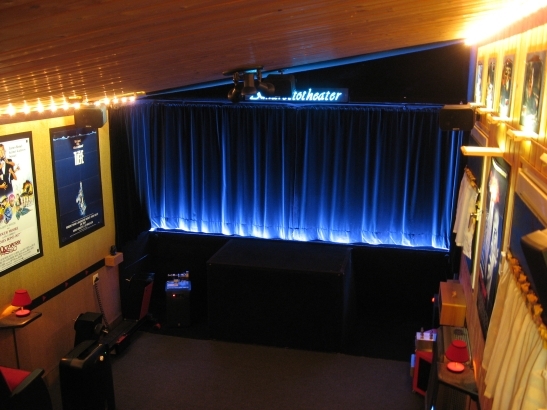 a friend has constructed a cinema in his parents' basement: http://www.joerg-palast.de/ (click onto "Technik & Ausstattung" on the left). Joerg, that really is some set up . 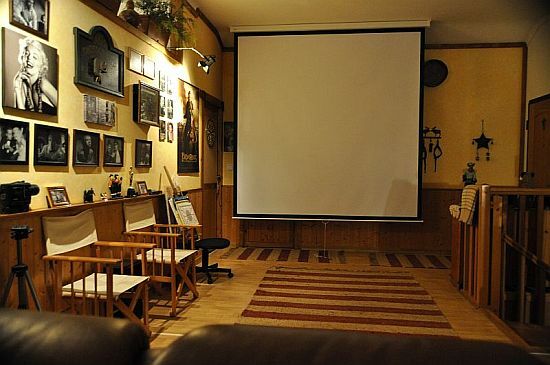 It looks like a whole cinema in miniature! I can't read German, but I think the pictures say it all . I have only one word to say Joerg - awesome ! Dan - 'Sweetums' looks like she's getting ready to roar like the MGM lion! 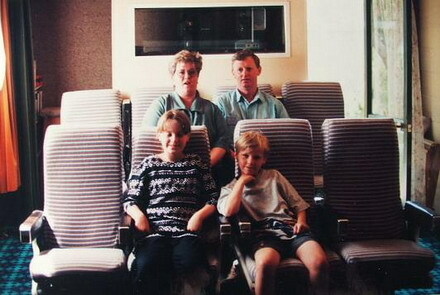 Here are some old photo's when we first started a long long time ago. 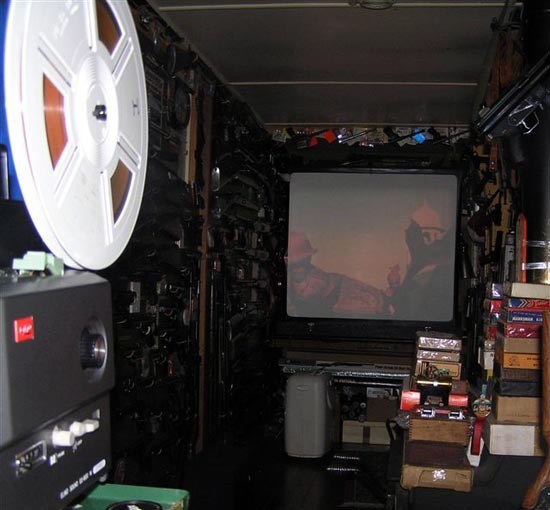 The Projection box was 40inches long, not much room . 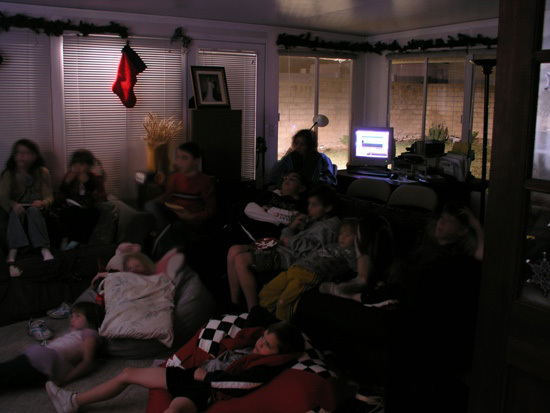 The last photo is of my son taken about 9yrs ago he still has his projector and films and still gets them out from time to time. The projection box had one GS1200 and a B/H 642 16mm projector the seats which are long gone are old aircraft seats which still had the "life jacket is under your seat" label on the back also they had fold down trays which came in handy, although those photos are old it was at the time a lot of fun building it. Is it true you are breeding GS1200s Graham? Yes, breeding plan going well with a healthy diet of Super8. When you put the Projector on that way (the most above GS), does not that make keystoning? How do you avoid that? The keystoning is only very slight, and the side masking takes care of it, good point though, and I wonder how they deal with it at some of the conventions held in Britain. 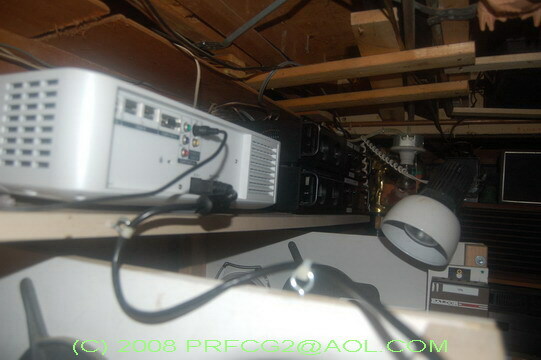 Some photos show the projectors angled steeply. Its nice to see some 9.5mm in your images Trevor. I am keen on the vintage gauge myself along with the Pathe 17.5mm within my own collection, not to metion 28mm KOK. Hope to chat more to you in the new year about this. 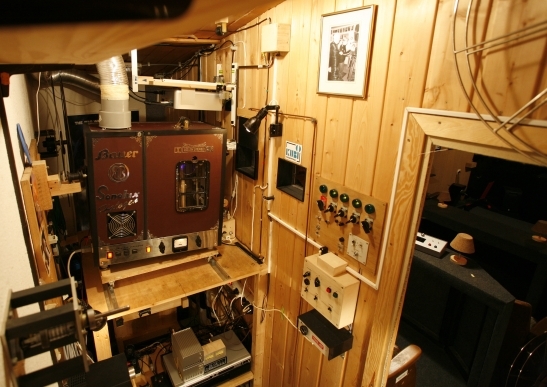 smallformat magazine would like to print an article about private cinemas. Please be so kind to allow me to show your cinemas too. Just send me some pics, some technical details, maybe a short story about the construction of your cinemas. lossau@smallformat.de - thanks in advance. and sending the picts too. Well, I was going to say the Chinon, but I don't play favorites! Not even with projectors! 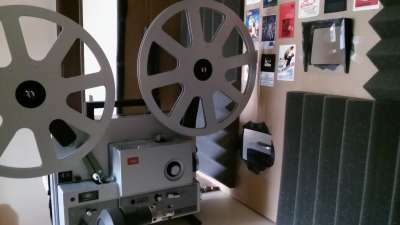 My Films / "Projection Collection"
Just had a look at your website, its very good, you will find everyone on this forum very helpful, with a wealth of knowledge on various gauges of films and projectors. 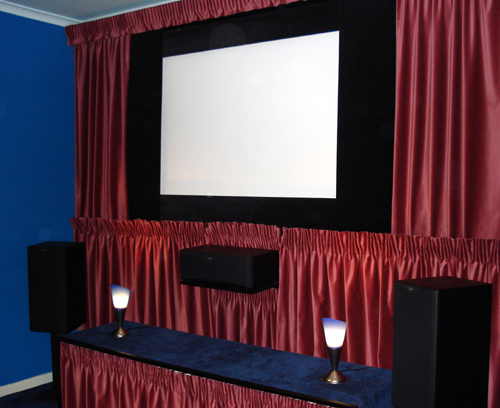 Here are a few pictures of our home cinema - we have called it "The Excelsior"! This is the screen with the house lights on. With the screen lights on set up for 'scope. The stage! Actually this hides some furniture underneath; your clothes still have to go somewhere!!! Here are the seats and projector stand. The Beaulieu ready to go. And the "cosy" seats at the back! 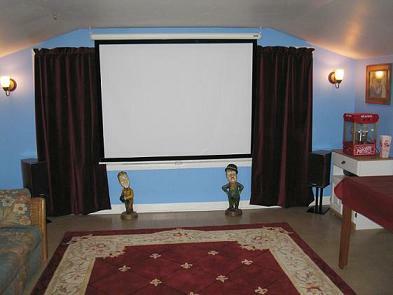 Your home cinema looks fantastic, I like your choice of colours, is that a normal dark blue paint you have used on the walls, the colour contrast with the red curtains is stunning. 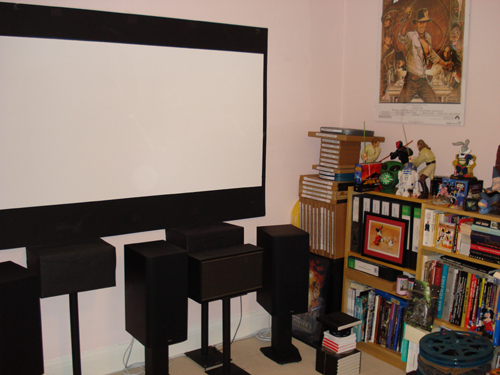 Here are some pictures of our other screening room; this one is in a house we rent so it is a less permanent set-up as it may have to be transported elsewhere at some point in the future! Here is the screen (sadly as it isn't our house we have to live with the colour of the walls although pink wouldn't have been my first choice!!!). The seats (these have to double as a spare bed for visitors!). The trusty Elmo ready for a scope show. Film cabinet; the collection is kept hidden away in a dark cupboard elsewhere but these are the films I like to keep handy! 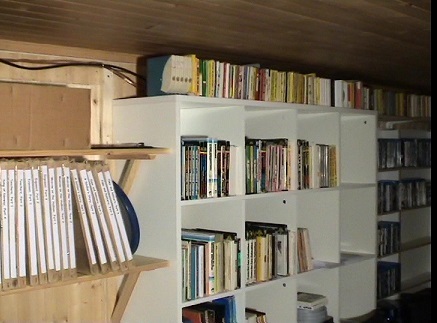 Lastly there is some room for an editing table for cleaning prints or doing a bit of re-recording. still works as a screening area. 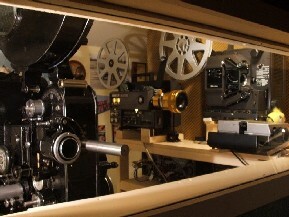 a designated space for film programs. are reflected on you eyes and into your heart. Hi Joshua, yes, I agree with Michael, nothing else matters if you enjoy what you have! When I was younger I had a set-up that sounds quite similar to yours. 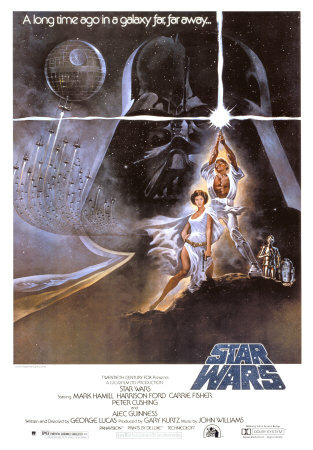 I remember when I first hired a scope lens (could no way afford to buy one back then) and a 400ft copy of Star Wars; I had to spend ages sticking together sheets of white A4 paper to make a big screen and totally moving the bedroom around to get a longer throw! This is the radio i place my projectors on (I now have them packed away in a box because I'm preparing to show my films to someone who lives far away.). This radio is also the amplifier for my Chinon Sound Projector. 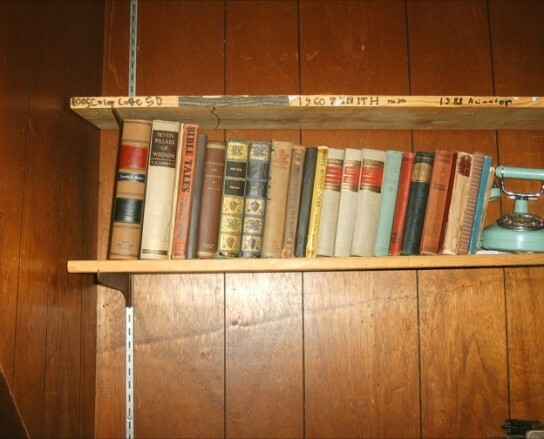 This is my old book collection, located right above my projectors. 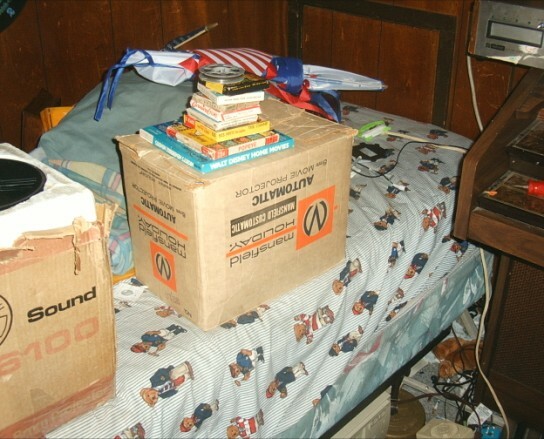 This is my Mansfield 8mm Projector, inside its box, on top of my bed (with films on top too). This is my Chinon Sound Projector in its box on my bed (as you can see, it is right next to my mansfield). 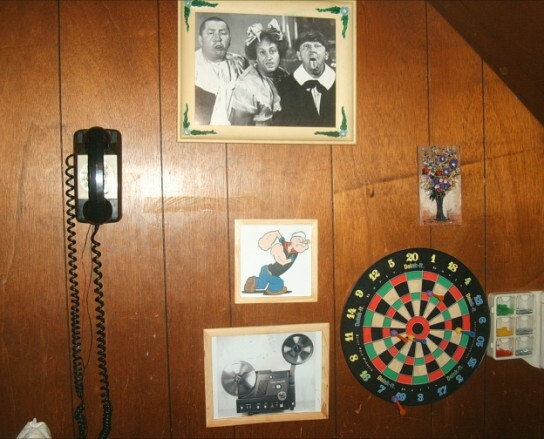 This is my wall, with a classic GTE rotary phone, a Three Stooges picture, a picture of Popeye The Sailor, a picture of my Chinon projector (i didn't take that picture), an (old?) 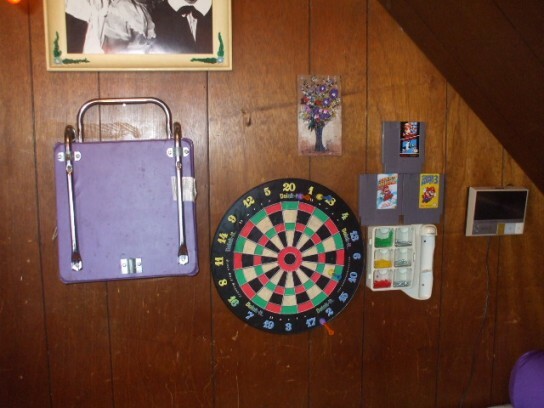 wood block with a painting, and a magnetic dart board. I did not see any pictures, you CANNOT do "copy" and "pste" things to attach pictures. When you are writting the text, under the box, there is written "Click here to upload an image", you have to click that and upload pictures. I think your internet browser might be loading the pics incorrectly because they show up fine on my computer (strange... ) I did upload and copy+paste the url code. Can anyone else besides me see the pictures? I can see them also. Being work with slow dial-up connection and a bi unpatient, I did not wait unril the browser fully loaded the pictures. Yes I have seen those Joshua's pictures. So... what do you think??? 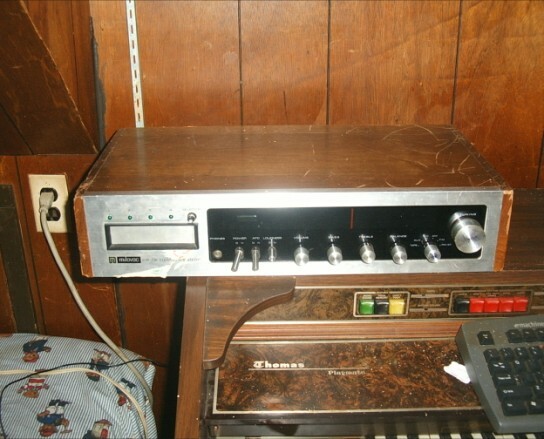 Was that an 8-TRACK player on your amp?? My last 8-track player finally died on me a couple of years ago. I miss it . Does the older amp unit provide good sound for your Chinon? 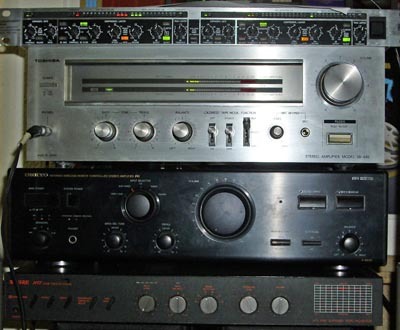 I was always happy with the standard stereo separation of the older units from the 70's. The good news is that lamps are fairly easy to come by. Steve Osborne of the REEL IMAGE publication in Ohio carries the popular lamps, and most likely will have the one you need for the Chinon. Also, Dave Thomas Films carries them, and he has an E-bay store. I have finally completed the addition of CinemaScope powered masking. The scope screen is now 108 ins wide. There are 3 powered masking panels, left, right, and top, which are controlled from an RF remote. The bottom masking panel is fixed. What a great job! One question......I see two really comfortable looking chairs for you and Betty. Where exactly am I supposed to sit when visiting? a job in sunny Florida. Doug! Old Florida customs says "toss a coin for a lap". 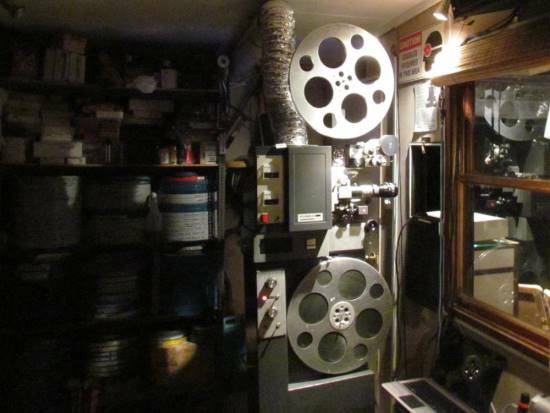 Welcome to Bill's Beg, Borrow, & Ebay Theater, an aptly named facility that is only functional once in awhile when various closets and corners cough up some of their contents... See, we have no place for a dedicated equipment area (I'm accepting donations for an addition to our house! 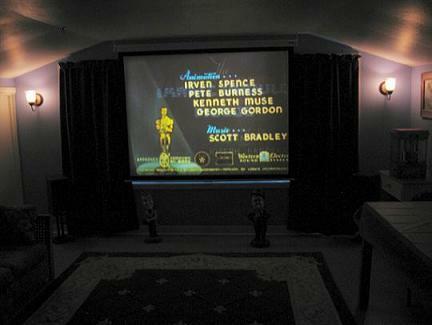 ), so we use our patio room, gleefully shutting the TV cabinet doors and hanging a 70" screen, with projectors outside. Sound ties into our hifi. Of course, the disadvantage of this setup is that long sunny days (frequent), extremely windy days (sometimes), rain (infrequent), and long setup times all intrude on the possibility of having a Film Night since the "booth" is outdoors. And the greatest disadvantage of all is that the equipment has to be set up, aligned, and connected every single time. So I only do this full getup once or twice per year. But one of the loveliest advantages is that projecting through the glass gives us perfect sound isolation so that the audio volume doesn't have to compete with projector noise. So here's the setup for our Christmas show. It was dropping below 50 degrees F when we started, but was very dry in humidity and there were no problems with this. That's an Eiki NT-0 16mm in back; an Elmo GS1200 that I wish I could say is mine, but is a loaner; and for just two shorts, a Canon PS-1000 in the front, which was my only other Super 8 option that evening. The show's well underway with Tom & Jerry's "Night Before Christmas:"
Big screen TVs, eat your heart out! 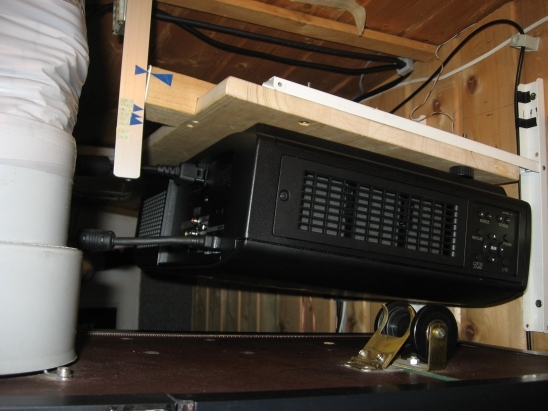 The center channel speaker is positioned for the occasion directly below the screen. That worked the film bug out of me... for at least a week or two! What a setup! I've projected from inside a house to the outside patio, but never the reverse! What can I say, Doug, you know what it's like to strive for well-tuned show, and for us this setup is the only way to do so. Hey, I did reverse it once on a comfortable evening, with the screen hung on the shed, kids watching on the patio! But couches & beanbags are more comfy. 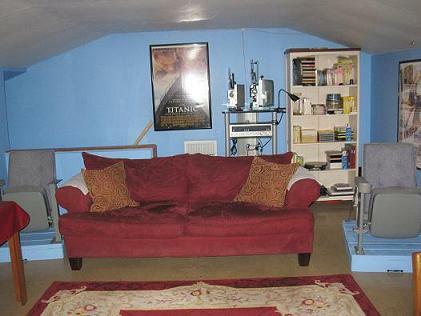 Now if Paul just had several rooms to rent in his house, and the bi-coastal commute were easier... now there's a setup to drool over. Not to mention Graham's, and others like Rob's "Excelsior." Amazing work, gentlemen. Nice Set-up Bill. I need to revamp my set up before posting it on the website. Still gotta figure out how to put the silly photo's on the forum. Still have those reels waiting for ya Bill. Thats a neat set up Bill. I've also done it in reverse like Douglas on a nice summer's evening. But you're right, there's nothing like a cozy bean bag chair to watch a movie from. I see you also have the Cano-sound! We are a rare breed. Its a great little back-up projector, though. One neat thing is how it re-loops itself when it encouters a bad splice, where as on most projectors I would have to push the thread button a couple of times, or stop the projector and re-thread. But that one projector way up on those milk crates. Yikes! I'd be scared to death to do that. You are a brave man Bill. 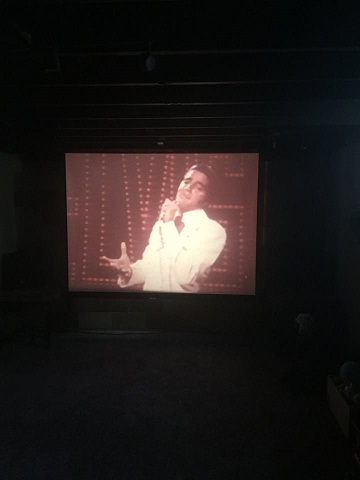 That's excellent, it's nice to see film projectors in action and everyone taking it easy, those bean bags are great, thats what this hobby is all about great stuff Bill. Thanks for the very kind responses, gentlemen. 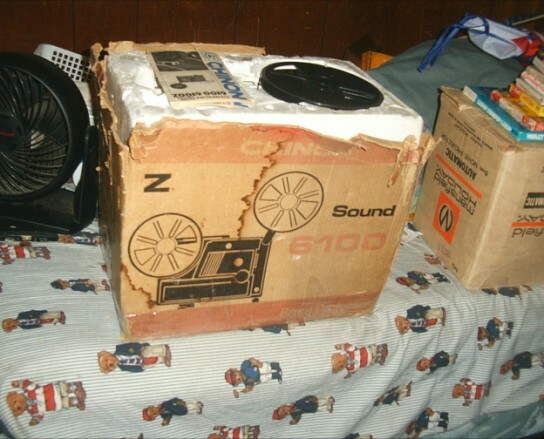 Yes, the CanoSound will play badly torn film. It's also fun in the fact that film is steadily projectable from the very first frame, and rewinding/fast forwarding is possible while loaded. But it's quickly developing problems that I don't know how to get fixed, particularly frame registration. RE: projector high on the boxes, yes, this could turn into a nightmare. However, the table and crates are exceptionally steady, I don't let kids out there, and all surfaces are covered in no-slip mats -- under crates & bricks as well as whatever the projector sits on. The latter fact isn't obvious in the photos but is really, really helpful. Accidents can happen, but so far, so good. Now that is cool can you tell me about the CanoSound unit who makes it? ...from the same people who brought us the legendary Canon 1014XL. It's a great little unit but is certainly not trouble-free. Which is scary since I bought mine as NOS, so there's likely less than 100 hours on it. Still a mystery who in the world has a service manual or would service it. 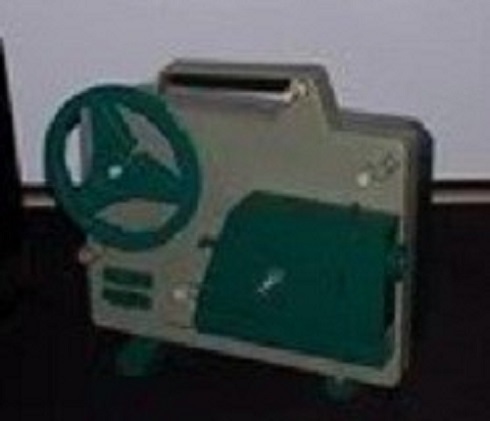 The Canosound projector was (I believe), the last super 8 movie projector released by Canon. It came out around '78 or '80. 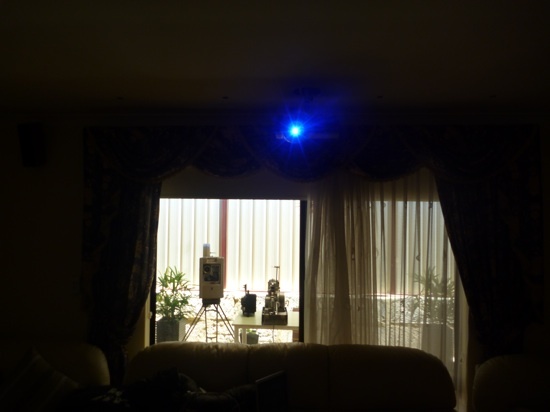 It is very basic as far as options- 400 foot capacity; 100 watt bulb; single track sound; f1:3 lens. 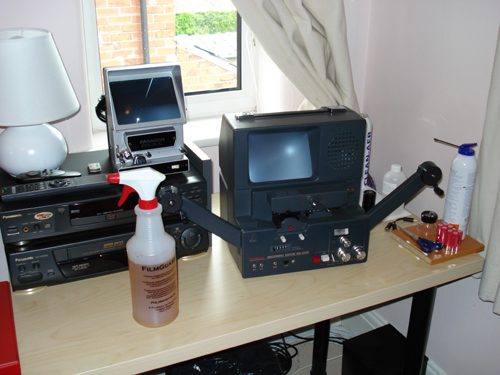 It is a good quality projector, not cheaply made, but as Bill said, its not easy to be repaired. I sent mine to eso-s years ago for a broken belt. After about a year, it came back and I havent had any problems with it since. 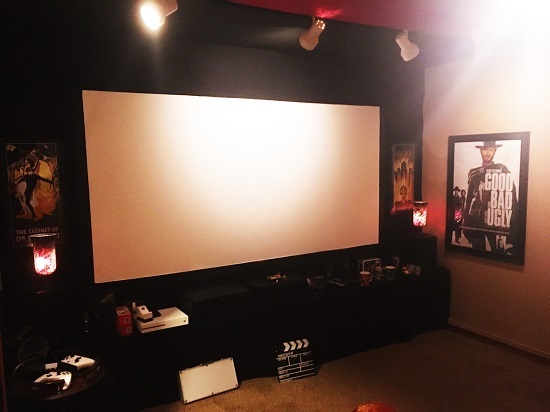 Just a few pics of my modest semi-permanent cine room. Floor lamp is on a dimmer switch. Room is bigger than it looks; had to compress picture to upload. Screen is remotely operated. Once door is closed left hand speaker is moved across, in front of the door. Very nice! I'm glad that uploading problem got taken care of. 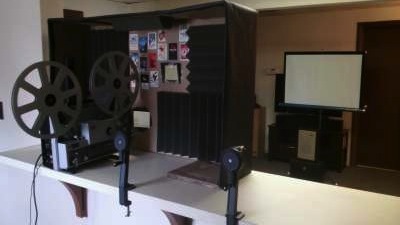 I'm so jealous of folks who can keep a permanent (or semi-permanent) screening room set up. Are there pull down shades for the windows or do you black them out some other way? I need to get some sort of blackout curtains, especially as the nights are now drawing out. I can just imagine Warden Hodges shouting " Put that light out!" from outside! 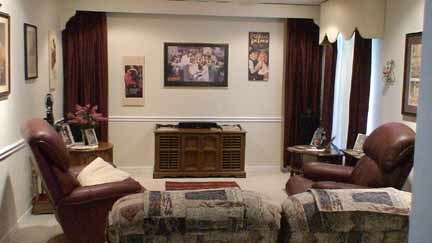 This is the set-up of my permanent home theater. But if you want to get back to the history of the room, you can proceed by reading this post first. 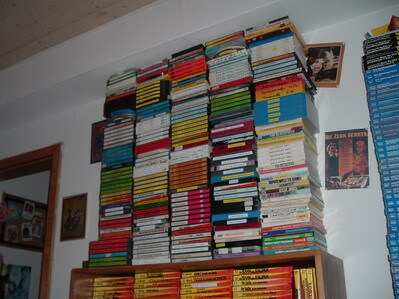 In a brief, I have three collections and they have to be accommodated in one room, i.e movie, train model and LP records. I can put blackout curtain to block the outside light coming from the window, but since I also collect train models, I've made movable shelves to store the train and toys. The rail I used for the shelves is those used for domestic sliding door. So it's easy to find and to install it. Since the shelves were made from thick wood, therefore, when they cover the window, they will totally block the outside light. As a result, I can get a pure dark room during daytime. I am happy with these shelves, since I can now watch movies during the daytime, when my eyes are still fresh (previously I had to do that during night time and I had to struggle with my sleeping time. It was very often I found myself fall asleep). The mirror ball is seen on the below photo and another photo from the other angle when the home theater becomes a mini discotheque. And finally, kids are enjoying the show. Very impressive! 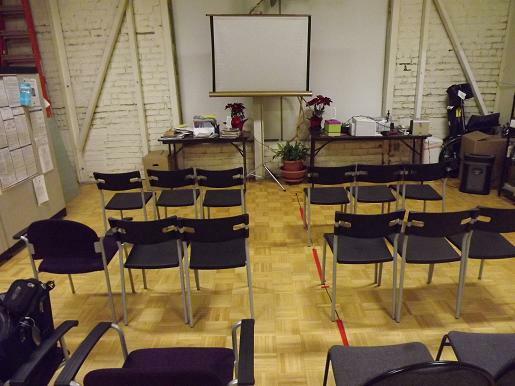 I couldn't tell from the photos....are the projectors in a separate room as originally planned? I ordered this project to a building company who was also doing my new house. In the blue print it was drawn with two separate rooms (as my initial aim). However, the contractor could not finish it due to certain circumstances. I did of course cut the payment. However, I eventually found that having two separate rooms will be too crowded in that limited space. So, lucky me and blessing in disguise, the today's set-up has more spacious rooms and I save a lot of money. I love it! It's like a time capsule to the 70's, with a touch of modern technology. It actually gives some dignity to equipment that was made 30 years ago. Young people today don't realize what high quality audio and visual we had back then. 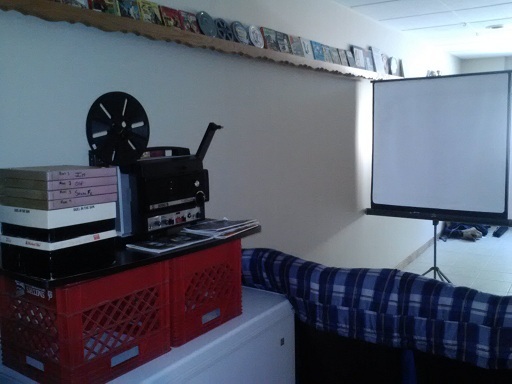 I used to want a separate projection booth, but I actually like having the projector in my viewing room, as it adds to the atmosphere (as long as its not a noisy projector ). Congradulations on a job well done! Hello, all 8mm forum members. 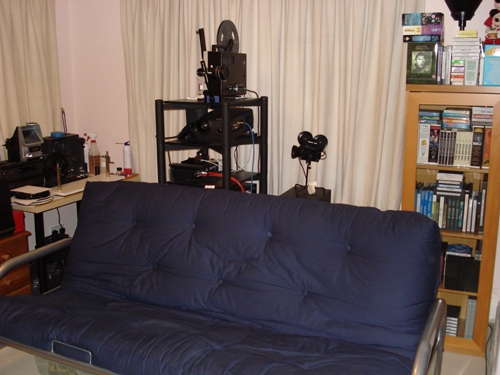 I just changed my screening room around, but its a little messy... 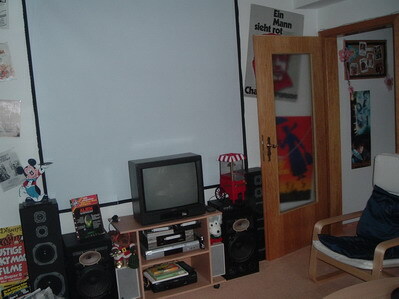 I'll take some pictures soon (my screening room is also by bedroom). EDIT: HERE ARE THE PICTURES! My shelf of Popeye collectables (im a big fan of popeye). 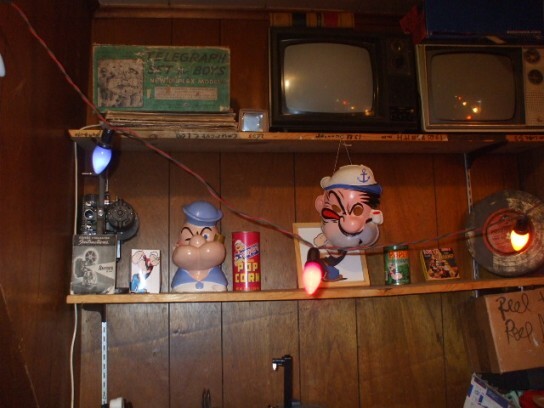 Also notice the 1930s-50s (im not sure which) Christmas lights. 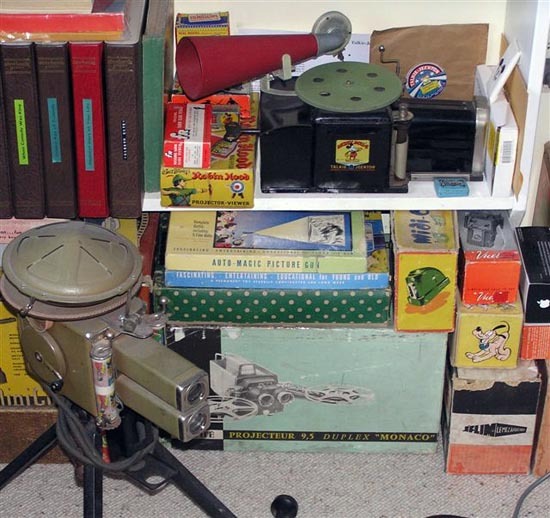 My 1946 REVERE EIGHT 8mm projector is also on a shelf with its original instructions manual! Here's where I keep my films. 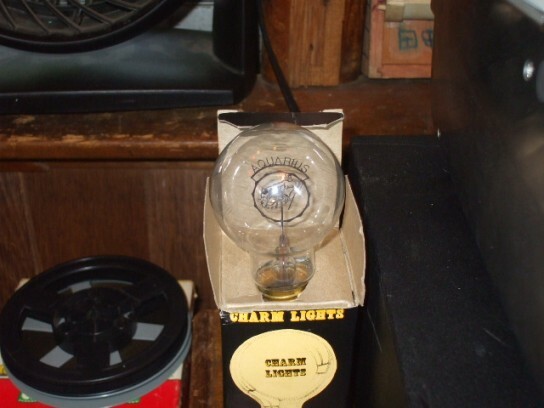 Here's a cool "charm light" I bought at a garage sale (I THINK its from the 70s). 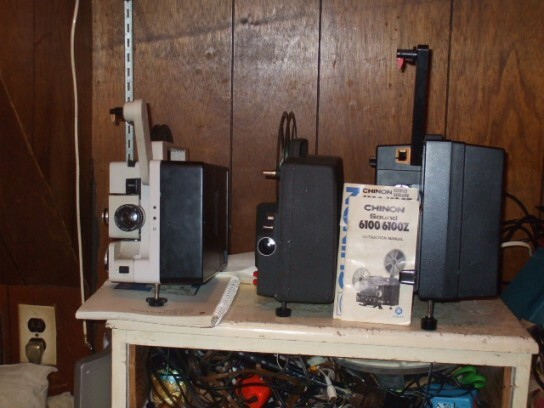 Here's 3 of my projectors (FROM LEFT TO RIGHT: Eumig MARK 610 D(super 8 and 8mm silent), Mansfield Customatic (8mm), Chinon 6100 (super 8 sound) (needs a new lamp again)! This is the computer in my room. It has great sound (3d sound and YAMAHA midi drivers). It's a Windows 98 Computer. 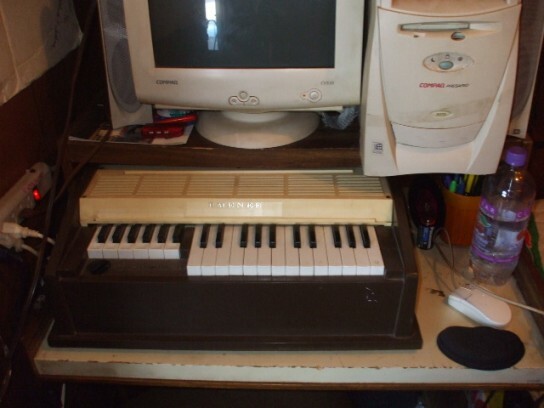 This is the 1960s-70s EMENEE organ that uses air to play music, not electronics. It sounds great and its fun to play. 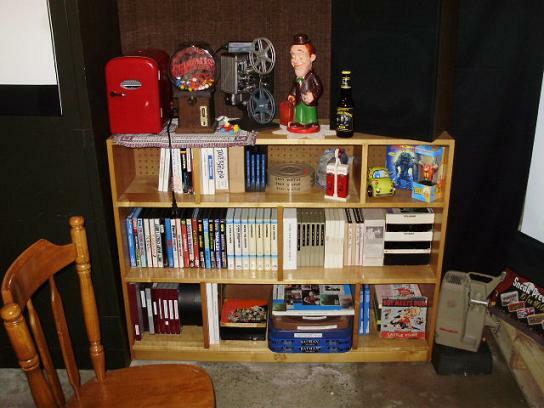 Joshua- for a young person, you seem to have quite a taste for older, nostalgic things (movie projectors, 8-tracks, etc.) That's really neat, and you don't see that very much with the younger generation today. That's one of my unique qualities. 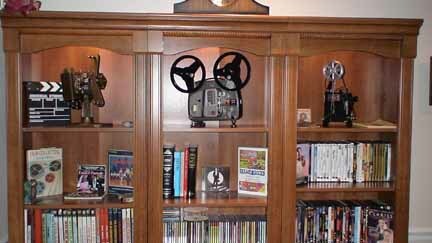 I like old electronics, video games, old cartoons, and of course, old projectors (especially the ones that work ) and old films. EDIT: the only tv in my room (right now, not in the pictures) that's set up is a 1960s black-and-white Admiral Tube TV. I was just the same as a kid. 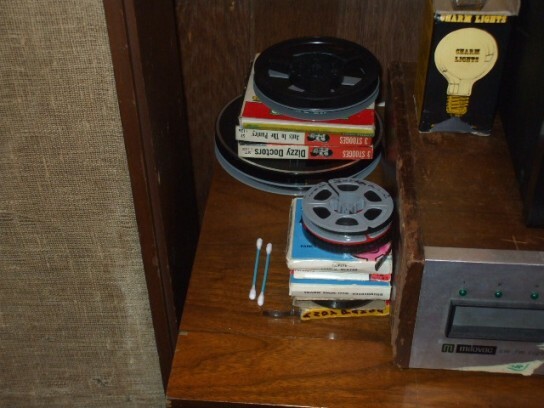 I loved going to jumble sales and buying reel to reel tape recorders and old radios with my pocket money, but I would often end up breaking them as I was always the curious type to open them up inside. I still love old electronics now. Its a nice feeling using something that is decades old which probably wasnt designed to last that long, and you can keep it going. 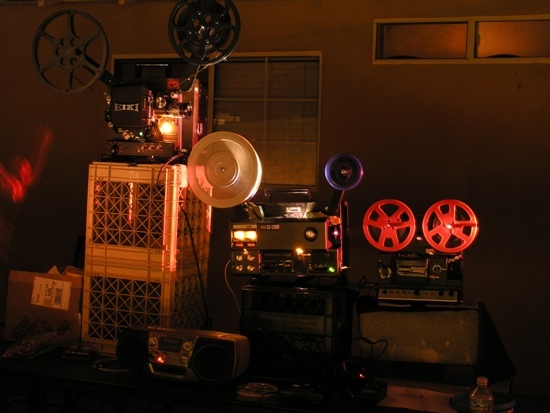 On a similar note I would love to keep my projectors going for as long as possible. Just imagine using the GS1200 in say 50 years time with all the complex stuff inside it. Thankfully I dont break things now but I was always doing that when I was young. 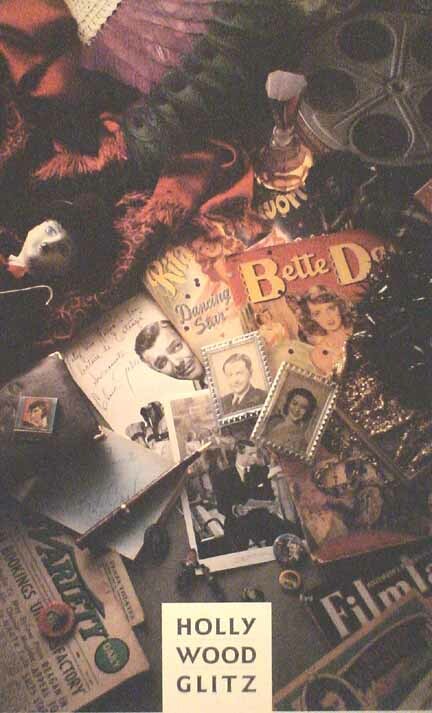 I remember my sister had one of those cheapo jewellery boxes with a wind up ballarina and musical tune mechanism. I remember my mum and dad saying to my nan "Dont let graham get hold of it, he will break it". Sure enough I did get hold of it and I did break it within minutes. 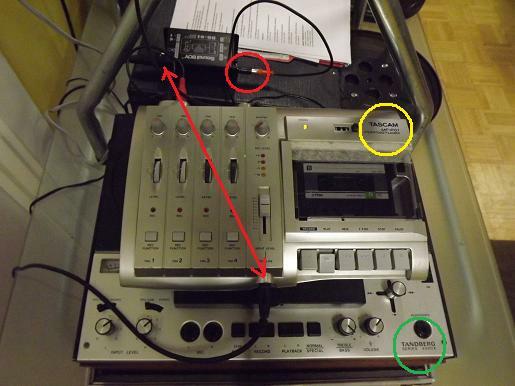 Yes Ive always had a fascination with Reel to reel tape recorders. Mabye its the good sound quality or the big reels that I can watch going round. 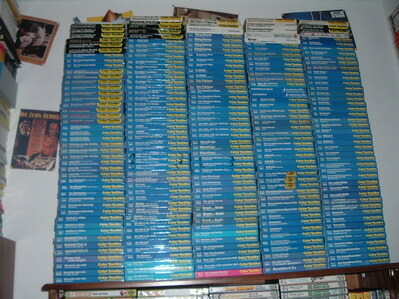 Ive still got 2 now and a number of tapes. 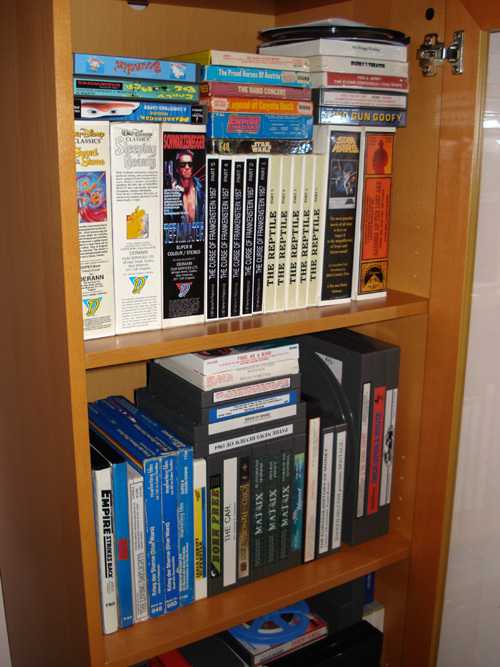 I was also interested in collecting different media's. I nearly bought an 8 track player and tapes from a boot sale once but I was undecided about it and it went by the time I decided I wanted it. 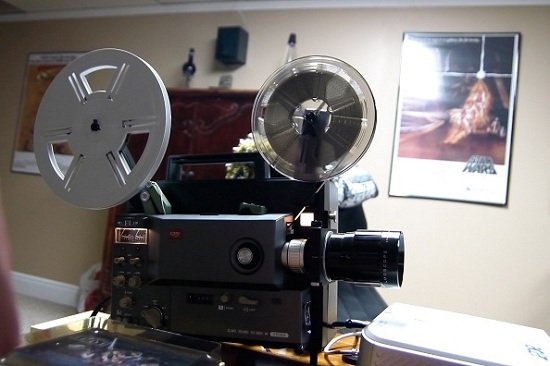 I only got into cine when in a junk store I thought what was a reel to reel tape on the shelf (due to the box), and it turned out to be a standard 8 film. I still bought it then I wanted to get a projector to play it on and I found one in another store, a Prinz magnon super IQ. 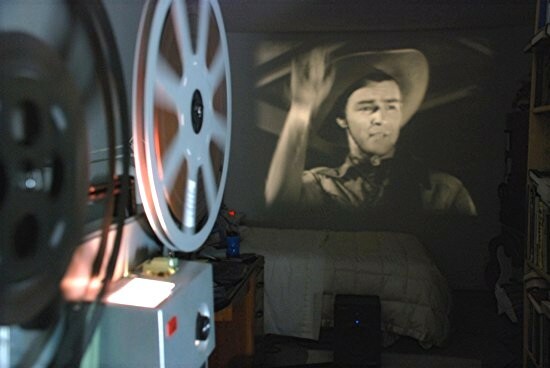 Then a friend told me of some silents in a charity store near me so I purchased them and projected them on a white painted door. And as they say, the rest is history. Here is a link to pics of mine. Thats quite an old model B&H, isn't it? It's in excellent condition. Good pictures, and I like the film reel light . EDIT: I'M THE FIRST PERSON TO POST ON PAGE 5!!! Well, Mr. Photiou asked for articles, so that finally got me going as far as taking pictures of my setup. I run Standard-8, Super-8 and 16mm. The Eiki Xenon with the long-play tower. The reels are 6000ft. 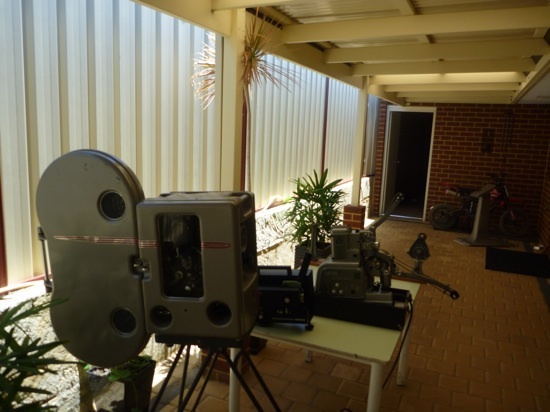 Goldbergs which can do up to about 2-3/4hrs of continuous screening in 16mm. 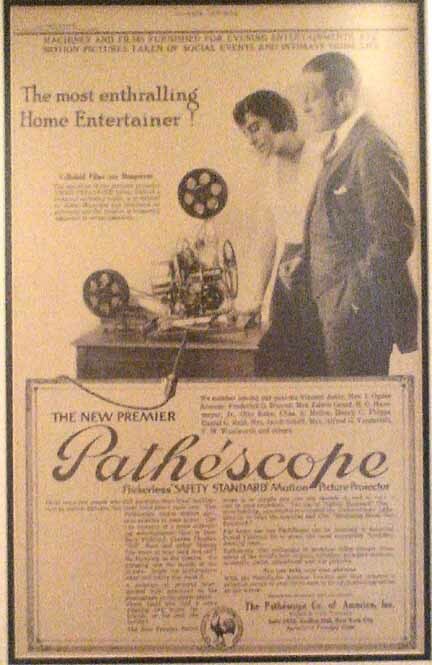 'Scope is about 8ft. wide, Academy about a foot less. The Bolex M8 gets to enjoy long-play too (but I do need a wider lens for it.) 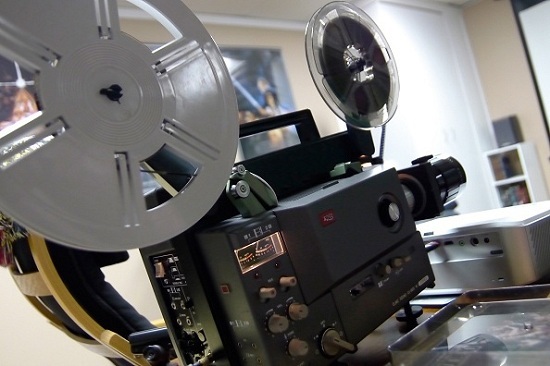 I love how all 3 formats collaborate: standard-8 film on a super-8 reel on a 16mm tower. Sound for all of the above goes through a Samson Resolv80 self-powered monitor (part of my stereo), that moves relatively easily to the 'screen area' and provides far better sound than using the projectors with 'passive' extension speakers. Given the restrictions, I am pretty happy with what I am seeing/hearing. I plan on building a stand with a front guide roller for the Elmo; at the moment I am using a small reel on the front arm when I use the tower with super-8, but I worry about scratches because of the flatness of the core of the reel. The Bolex M8 takes the Eiki guide roller without it even being locked on the arm; it just stays there from to the film tension. We plan on moving next year, so that could mean a real screen and such; we'll see. For now, it is enjoyable as is, and that's really what counts. My throw is also just under 25ft. What is the Scope lens on the Eiki? Do you use a primary lens with this? 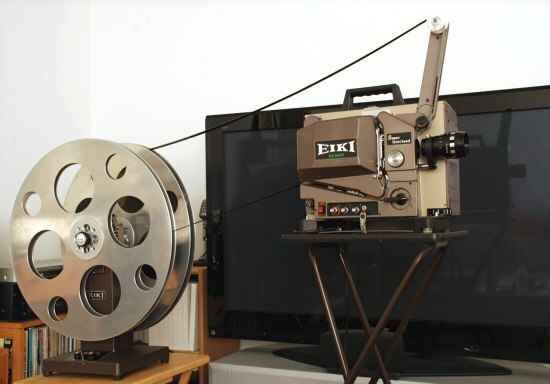 Those pictures are really good the projectors look like they are all in mint condition in particular the Eiki and Bolex M8 running of the long play unit. Pictures flatter, but yes, both machines are in nice shape. The Eiki must have been sitting for a while; the seller said it had a "sound problem, but was otherwise ok." It turned out to have the wrong exciter bulb in it, and, once replaced, it ran flawlessly. The Bolex I never get tired of looking at It too came from EBay, from a very good home, and you're right, for a machine from 1960, it couldn't look any better. Nary a scratch as the saying goes. And to top it all, it runs perfectly too! 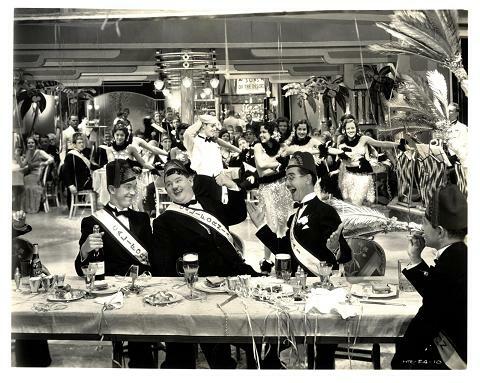 That shot of Oliver Hardy - is that 16mm or 8mm? Your comment about the wrong exciter lamp reminded me of a Bell & Howell TQII I bought some years ago. 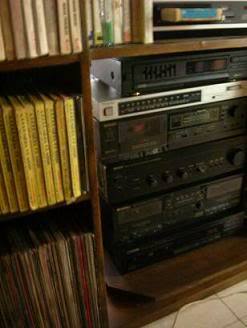 "You can have it cheap," says the owner, "It's got very low sound, probably the amplifier." 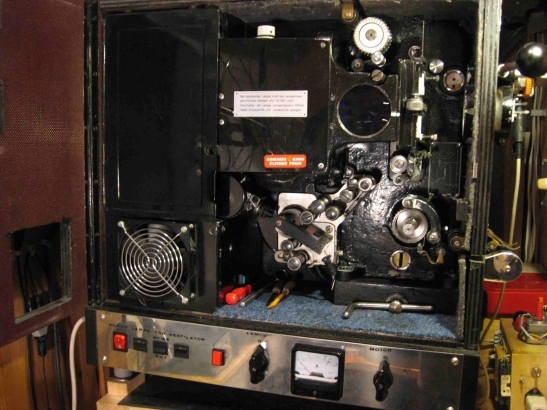 Once it was home a quick check revealed it had an Elf G27 exciter lamp with vertical filament, whereas the Bell & Howell uses a G29 [horizontal filament]. It was no wonder that little light was geting through! Oliver Hardy is from a 16mm print. It's nice when it works out like that. In this case, the exciter was an over-sized model, and as soon as I took one of the 'regulars' from an SSL and adjusted the bulb height a bit, everything was fine. Hello to all. Success at last! A: The big wall to wall screen. 4 speakers behind it. B: The frontwall of the booth. 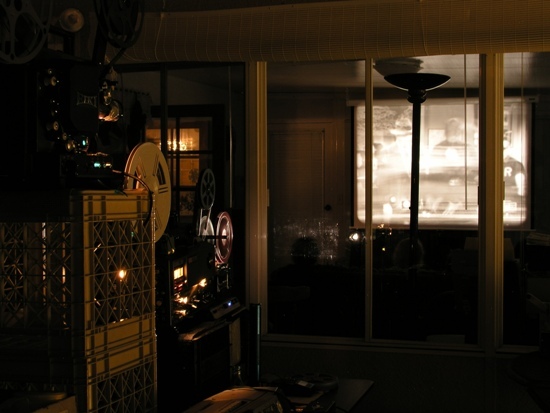 Towers 1 & 2 (bottom), projectionist wide view window (middle); and the Panny AX200U (top). 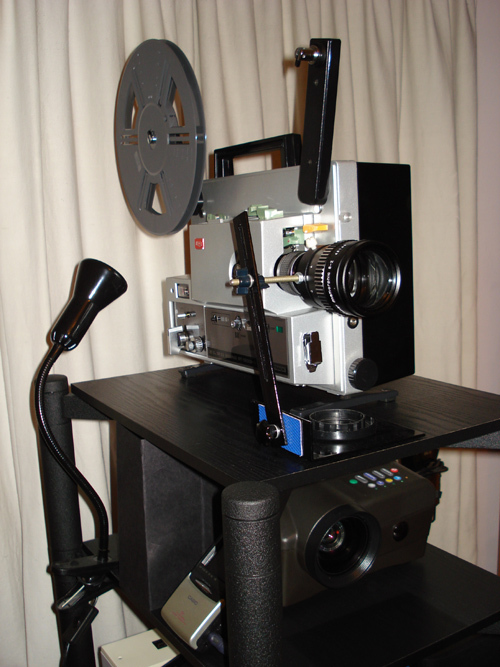 The super 8 projectors are 1 pair Elmo ST1200HD /w optical. E: The Panasonic AX200U installed above Tower 1. 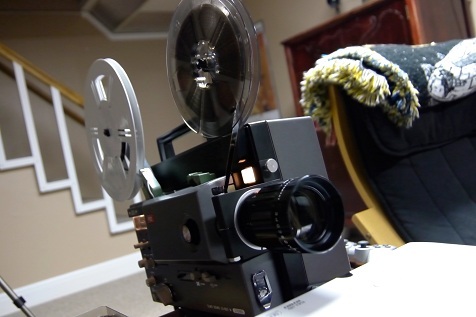 F: I am now pleased to report that I can run 16MM in addition to the DVD and super 8. 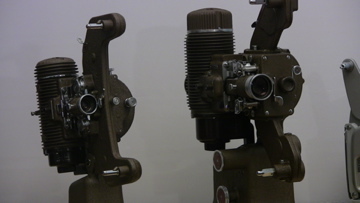 These are Bell & Howell Slot Load models 2580. Purchased from Ebay and I installed new motor and take up belts. Away they go! 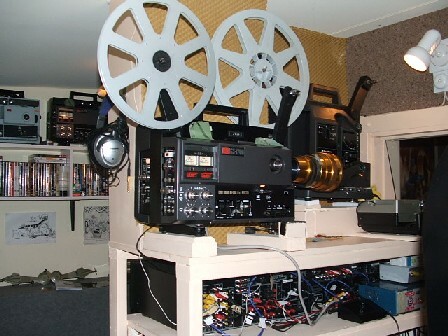 The small tape selector box between the machines serves as projector 1 - projector 2 sound changeover, sending the sound to the Pro Logic units inside the booth. I was surprised how quiet running these machines were, given the fact they are not sound proofed being run outside in the screening room directly. Yes they are obvious, but not as loud as I thought they might be. A wide shot from the screen showing the large room. I take it the clothes are there to cut down sound echos and deaden the sound character of the room? We really lose out in the UK by not having basements! 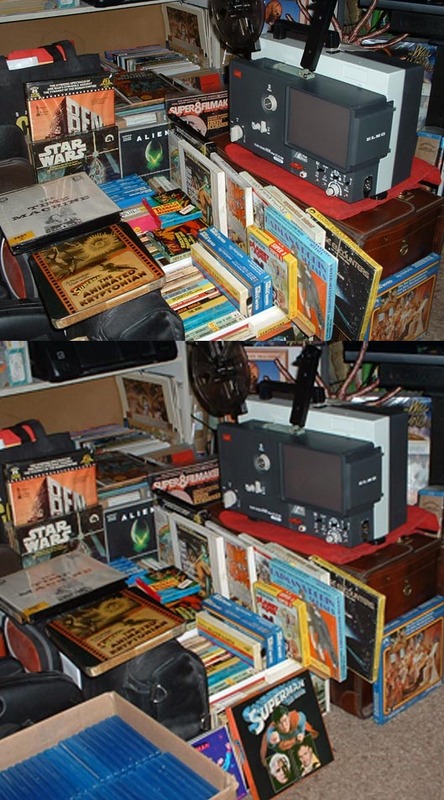 I must get some shots of my setup when I can find the battery charger for my camera. 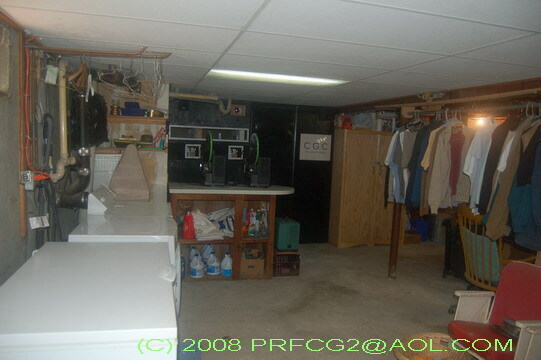 When I run Poltergeist those clothes seem to move throughout the basement without being touched. And if you believe that please allow me to charge you admission when you arrive. IT'S FREAKIN' WIERD. "Good Sir! If it ain't too stoopid a question - how do you organise reel adaptors for 8mm to make use of the tower? I got our local Perspex firm to cut me two platters to fit inside a couple of 3000ft 16mm split reels. It is a bit clumsy but it works - although I have to admit that the tower and reels behind a little Fujica SH6 does look a little strange. I also used a 50ft reel for the top spool arm - I cheated slightly and stuck a bit of a silicon impreg duster in it so it sort of polished the film as it went (the duster fell out after a while!) Anyroadup, any info you could let me have will be gratefully received, etcetcetc. Cheers, David Erskine"
I thought my e-mail was active here; I'll have to check the settings. Try me at chavideo (at) hotmail (dot) com. I haven't bought from there yet as the prices and the exchange rate still scare me (! ); since I haven't needed many so far, I went with used. Please let me know if you have any other questions; I'm happy to help if I can. 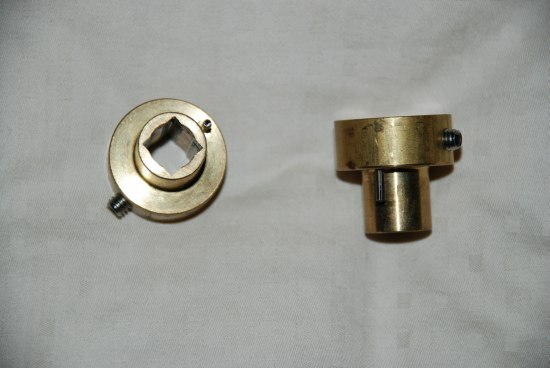 As far as I know, those brass adapters are a Neumade product. Steve Osborne and Larry Urbanski have them available. My super 8 Towers have these as well and they are very good. "You've all done very well!" (Graham Sinden should know where that came from!) I think the pics of the tower with everything are marvellous. I got some perspex cut to fit a 16mm 3000ft split reel (so I could run 8mm - of course!) (Memo to me try not to use so many exclamation marks or 'd-g c-ck' as old time printers call 'em). Anyway, I used my tower with a Fuji SH6 (the little one) and it worked very well - but did look odd. 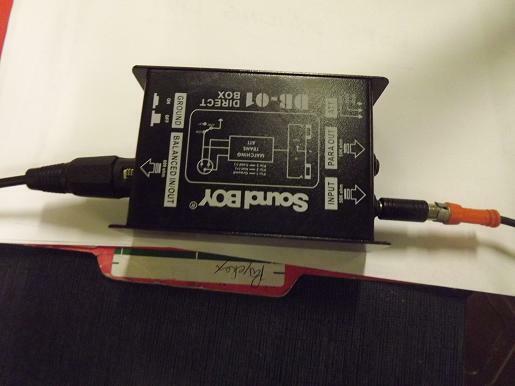 However, now I'll try Wittner for those adaptors - if I can get them to understand me!!!!!! Also I'll email Mr H. Cheers, chaps. "You've all done very well!" 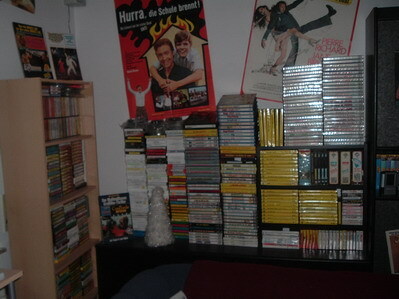 Filmcollection. Mostly Disney cartoons, some films i shoot myself, a five Chaplin and Laurel and Hardy and one full feature lengt film: The Navigator with Buster Keaton from 1924. 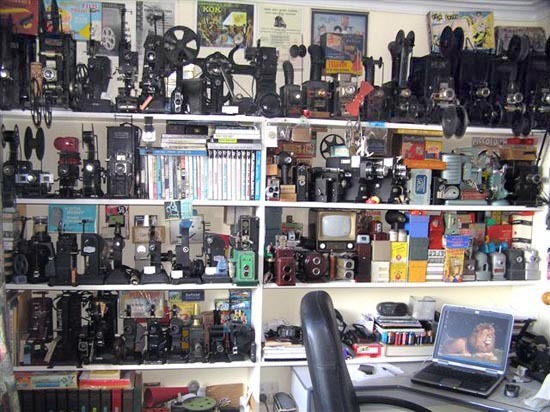 Collection of old cameras and projectors. 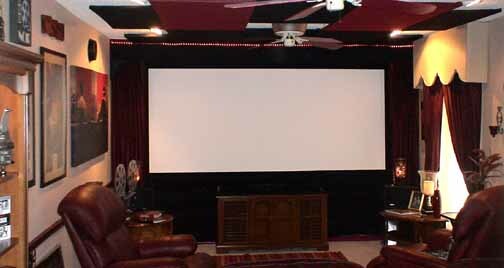 Movie screen in the living room. On a rare occasion I've seen a Eumig takeup reel on Ebay with circle cutouts that looked extremely unique and cool, Doug, but don't know if it's 400' or 600'. Personally, I don't care. It looks more like a 35mm house reel than most. 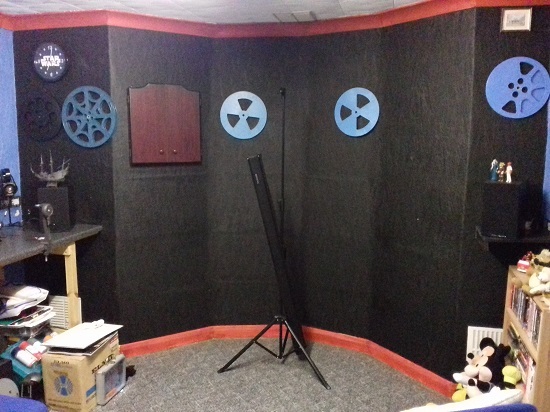 So, having begun purchasing reels and equipment, aswell as joining this forum, I decided to make myself a little screening room where I can enjoy films. So armed with some old furniture, an overfilled storage room and the ability to clean, I began making my own little home cinema. Here's a video of the process, with some before and after shots, some clips from the progress, aswell as video of the projector in action after it's done. I have a sound system ready for use, but I'm missing an adapter to transfer sound from the projector to the stereo, so I haven't set it up yet. 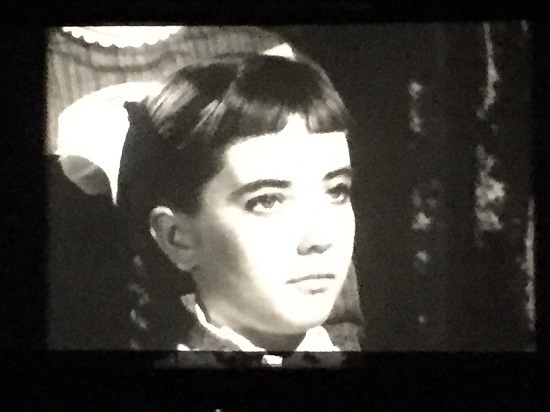 This lifted from my recent post under "What films did you show last night"? 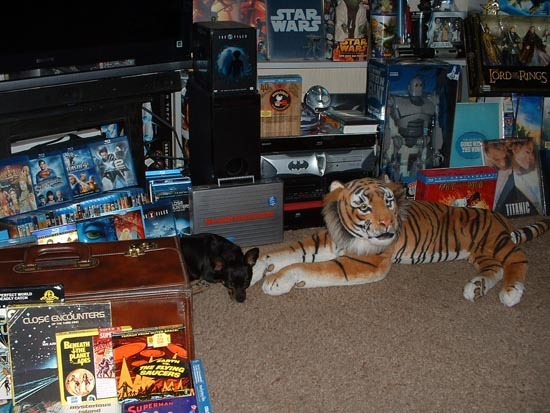 My dear wife (Carol) has just agreed that we can use / turn the spare downstairs reception room, currently affectionately refered to as "The Den", into a cinema room!!!!!!!!!!!!!!! Wow - how about that!!!!!!!!!!!!!!! Obviously this will take some time to accomplish - so watch this space. Don't get too happy, too soon, David....there's got to be a "trade off" somewhere! Michael: our daughter (who's turning three soon) has been attending shows since she was around one. Although she's used to monsters and such (I have all sorts of skeletons, props from haunted attractions and she cherishes a Cthulhu plush toy) we plan special matinees for her with cartoons and comedies. And she loves it. See my recent pictures in the "what film did you show" topic. I showed her some Disney-cartoons and she loved them. But when she should sleep right next to my screening-room, she knows, that I am looking films and she wants to see them with me. 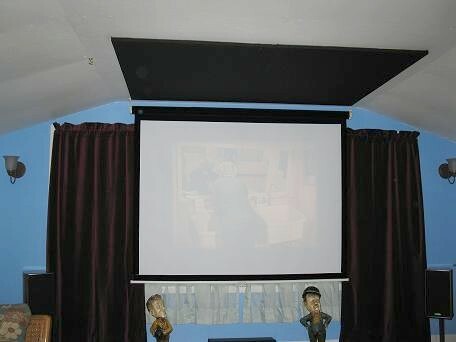 In the back you have the shelf with the projector on it (projector is dark blue), projecting onto the wall on the other side of the room, where I have a homemade screen, about 5ft x 3,5 ft in size. I am currently using my newly refurbished Elmo ST-180M which runs like a charm. From the projector I have a 3,5 minijack to RCA cable (red lines are cables) running to the stereo (the light blue part), which again runs to two speakers below the screen. I also have two more speakers that I'm planning on putting behind the seating to create a "cinema effect" but I don't have the sufficient cables for it at the moment. 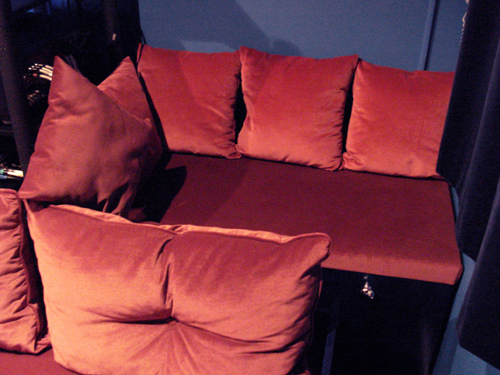 The screening room currently has seating for approx. 5-6 people + myself in the "projectors throne" in the back, next to the projector. 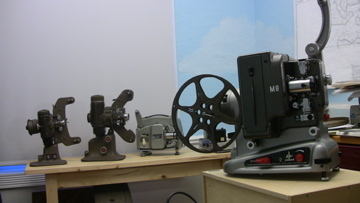 Having seen pictures of Members' screening rooms, I thought there might be some interest in my 16mm projectors. As can be seen from the pictures below (assuming I have managed to upload them correctly) I have two Eiki NT1 machines with anamorphic brackets and lens, and two Bauer P7 Universal machines. As yet I do not have anamorphic brackets for these, but I am hoping to get them soon. 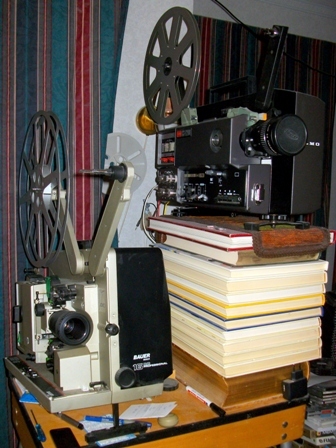 As you can see from the picture of the Eiki machines, I am also into Super 8mm, having a Eumig machine and a Bell & Howell (Sankyo) machine. 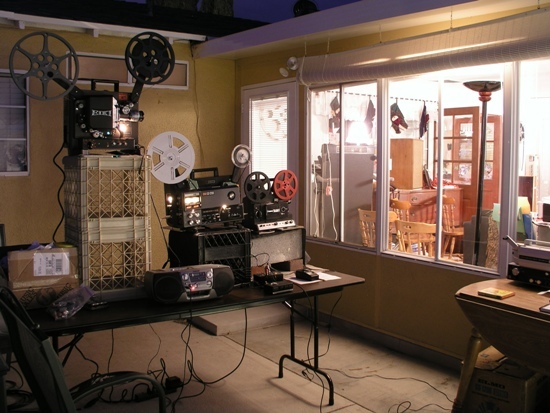 I still live at home and thanks to the graciousness of my parents and the incredible luck that there is a large window on the back wall of their home theater, my 'film junk' gets to sit outside on screening nights. I am only set up to run BR/DVD/VHS/LD and 35/16/S8 but that's enough for now. Obviously I have to wait for the sun to go down to see anything. 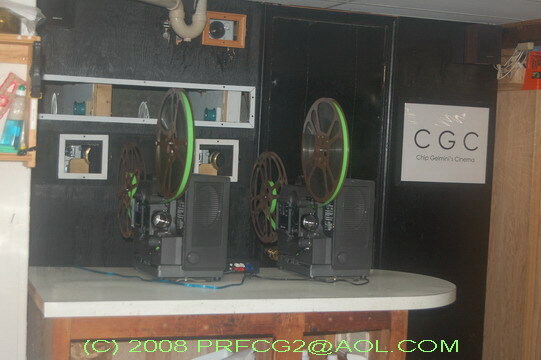 These images show the typical layout of projectors for a show involving all 3 film gauges. View from the inside looking out. 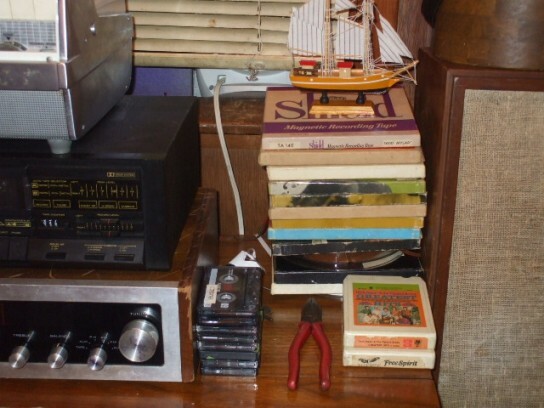 Damien, I have a regular Seeburg juke box 45rpm 100 selection (a Marauder from 1972) sitting next to my rewind bench here at home. Whenever I am winding or checking film or doing any other work nearby it belts out a selection from my singles collection. We formerly owned a jukebox and amusement company and this is the only juke that we still have from the dozens of record boxes we once owned, not to mention all the CD units. So everybody,i had my sundayafternoon screening,so i thought let's make a photo! 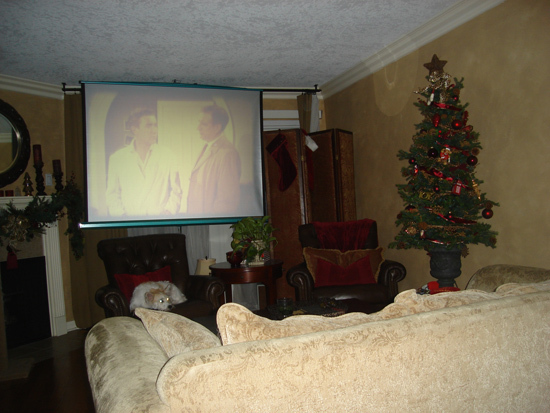 So for everyone,i watch my movies in the livingroom on an old screen,this year i'll buy and new and bigger screen! Today it was Pinocchio that was on the watchlist! 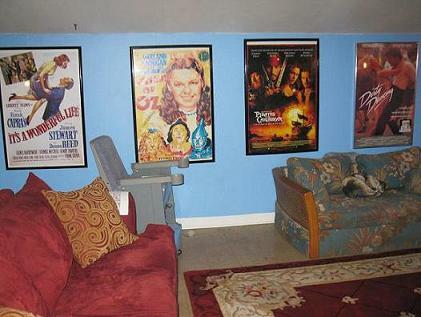 Pics of the new screening room here. What brand/model are the seats? 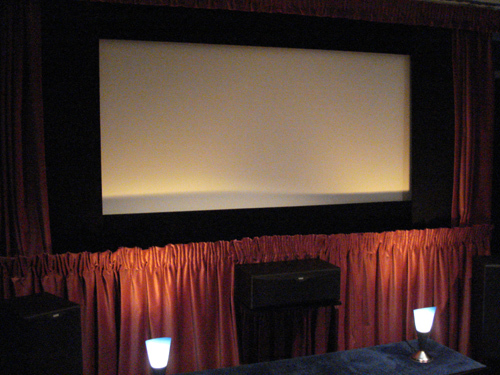 Is the screening room located in a house, factory area or cinema complex? Excellent, but, too much glass between booth and auditorium for my personal liking. I'm a little old-fashioned in that way. 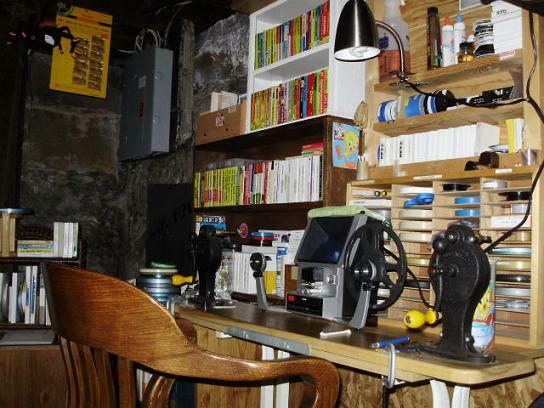 These posts are great -- some really impressive setups. My wife always thinks I have way too much stuff. I showed her some of these pics so she could see how small-time my operation is. Maybe now she won't complain if I pick up a few more things. Brad, I'm almost physically drooling! The auditorium is amazing, but I loovve that projection room! but, a transplanted auditorium from the local multiplex. with deep pockets of popcorn. 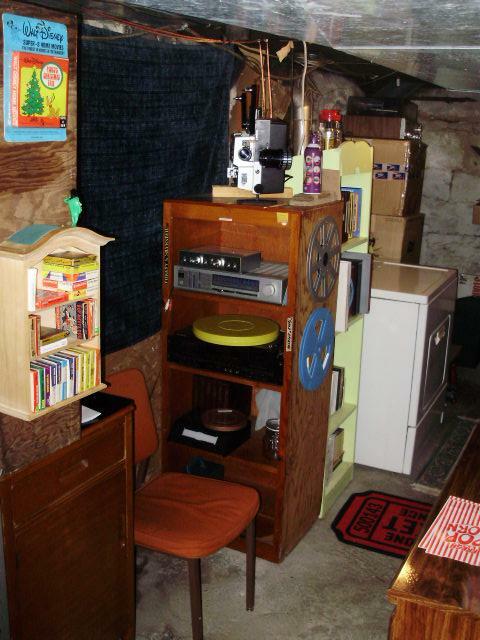 On one of Keith Wilton's "Armchair Odeons" tapes/discs there's a guy who has his projectors on a turntable in the attic - and can just about get his top half up by them to load film -- but he daren't put weight on!! Brad's place is VERY impressive - I drool too - but then I go out to my cinema in the garden and walk in sideways to avoid tripping over stuff! Carol says she's going to sort me out and build the prosc arch and masking etc - and fit a 'Safety Curtain' too! I passed a major milestone today. The speakers are a nice big set my Dad once had. Unfortunately the foam surrounds on the woofers are shot so I'll be buying replacement foam kits and rebuilding them. Worse comes to worse I'll buy new speakers, but I'd like to give this a shot. Next step after that is to build some sort of interface to take the outputs of two projectors and feed them into a spare input on my Amp. It was like a two evening project, not that hard, just one step at a time. 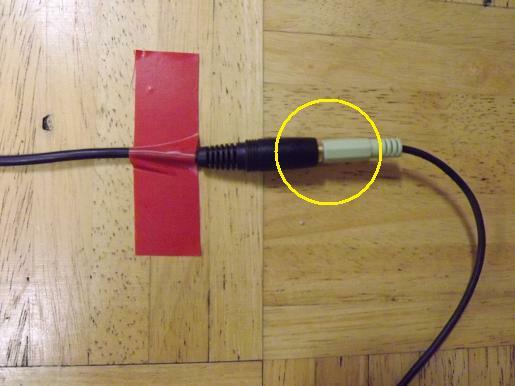 Next is to build a circuit to take the aux outputs of the projector and feed them into the stereo amp. 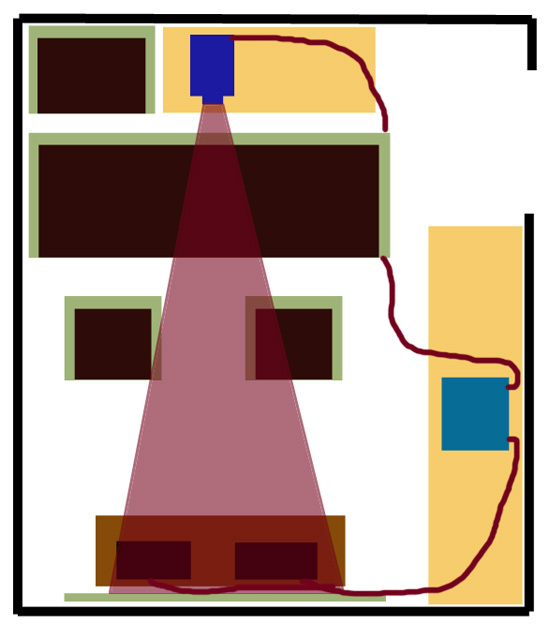 Since the projector and the amp are going to be plugged into different outlets (distance), I'm going to start with a circuit to break any ground loops and then work on circuits to eliminate hum. I have the board, I have the box, I have some of the parts...all that's lacking is time and energy! 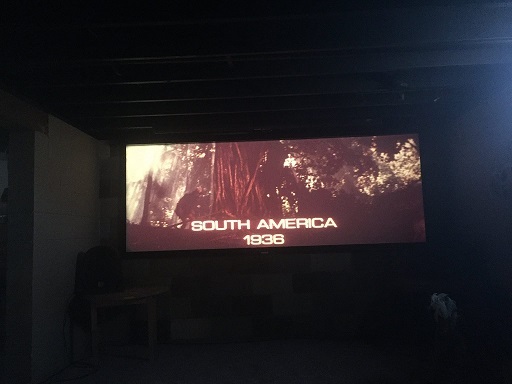 These are pictures from my screening room . 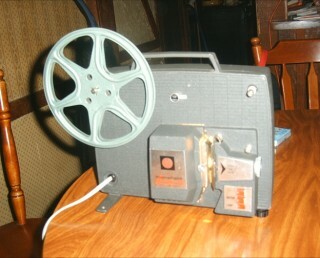 I love my ELMO Hi Vision SC 18 2 Track Super 8 sound projector. I love Sci Fi films and Superman 40's cartoons. 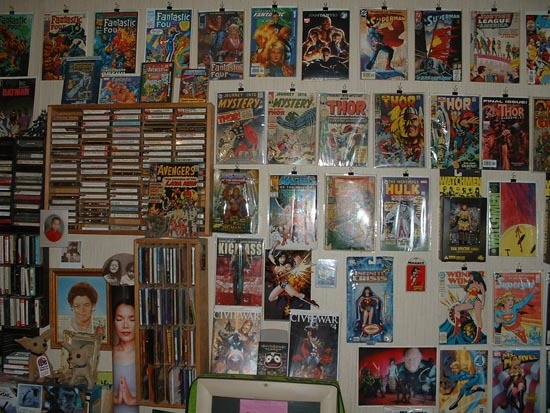 I have been collecting for 45 years this is only 1/3 of my collection. 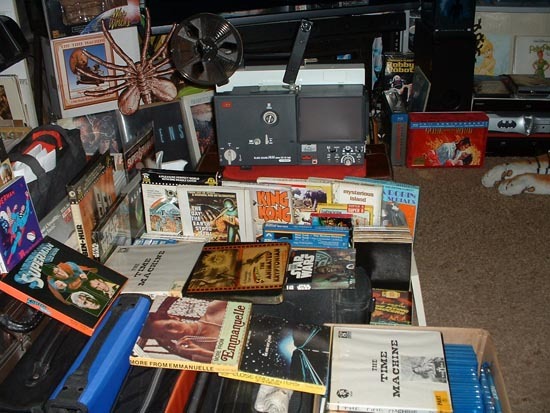 I started collecting in the late 60's 8mm silent films and then in the late 70's to late 80's sound films. I live in Las Vegas in Pahrump near Area 51. 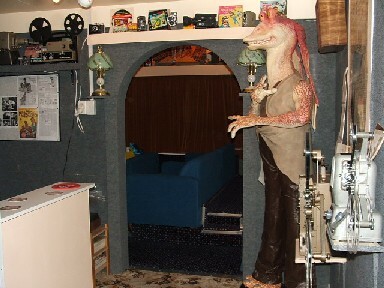 This is my Home Cinema..i am 34 years old. what are the yellow/red boxes? 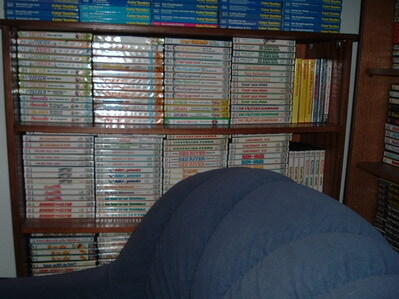 Those yellow/red boxes are releases from Piccolo Film. 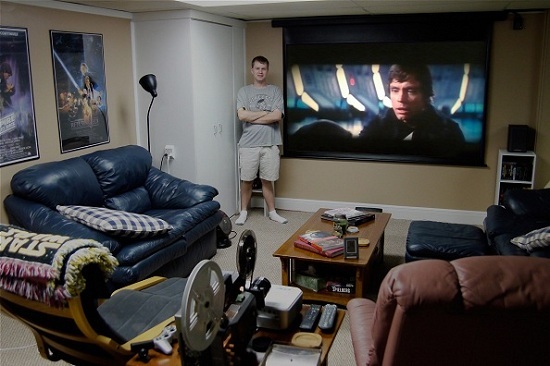 I have made a few changes to my Home Cinema in the past few weeks. 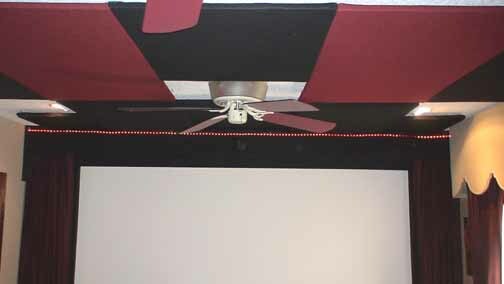 First I repainted the walls in a darker beige color, and then I added a black light baffle onto the ceiling above the screen and some burgundy panels onto the ceiling over the seating area. The purpose of this was to reduce light scatter form the walls and the ceiling back onto the screen, and it has had an amazing effect in boosting picture contrast in both film and digital screenings. 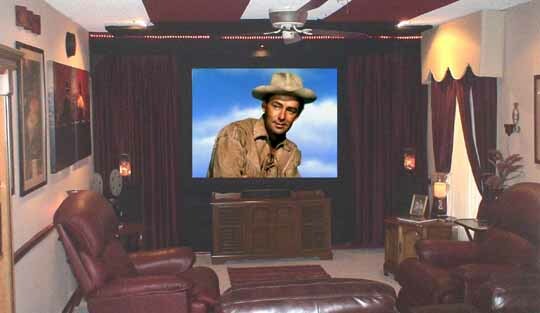 Beautiful screening room Paul. Great job! 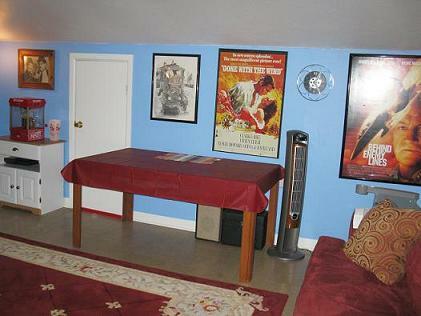 Terrific screening rooms for two collectors at different stages in this great hobby! Thanks Osi and Doug- it's been a lot of fun and is, of course, a work in progress. And Austin - I started off just like you but with much lesser equipment than you have - a lowly hand cranked projector with a 10 watt bulb! Austin...you did a great job! 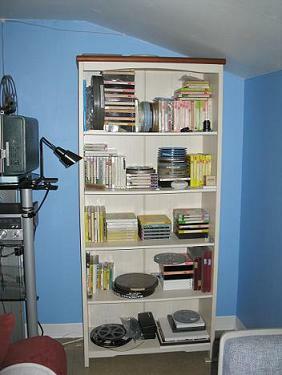 GAF looks good and I too like the shelf with films on display! Very nice! Are the picts from the actual projected film, or a reference to show the depth of the images. How are you able to adjust the black panels around the film screen? The set-up is comfortable and gorgeous. Thank you Michael for your kind comments. Unfortunately it is impossible to take these kind of pictures with an actual projected picture, as the room lighting has to be turned up considerably in order to photograph the room, and under these conditions the screen picture is 'washed out'. 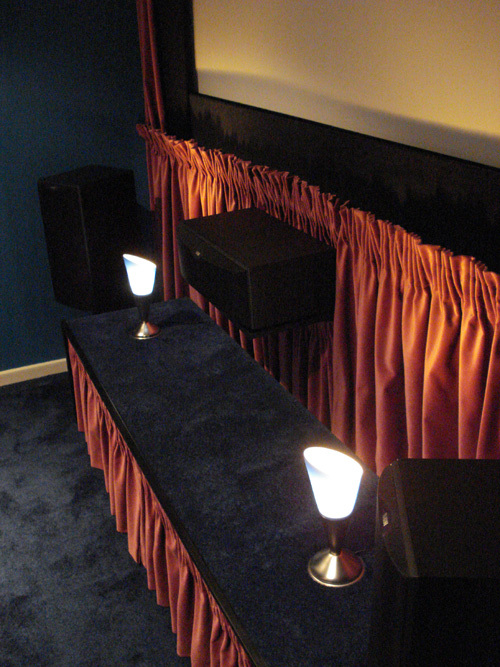 So, as is standard procedure in all the home theater magazines, the picture is a composite. However the screen pics are the same size as I get on my screen for 4:3 and scope, and are very representative of the picture quality that I get in a darkened room with digital projection. The screen has remotely powered masking, which I did myself. It has left and right panels which move in and out for the various widescreen and CinemaScope format ratios. There is also a movable top mask which comes down for just a little bit of top masking for 2.35 CinemaScope, and comes down further for 2.65 Technirama and super 8 scope. The curtains move on a different track than the masking and are independantly controlled. 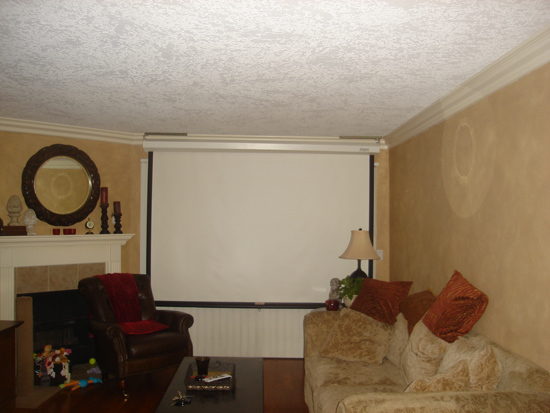 Both the curtains and masking are controlled via an RF remote. The room ceiling lighting and accent lighting is also dimmable via RF remote. you have this down to a science. "It's the stuff that dreams are made out of,"
and made the dream a reality. 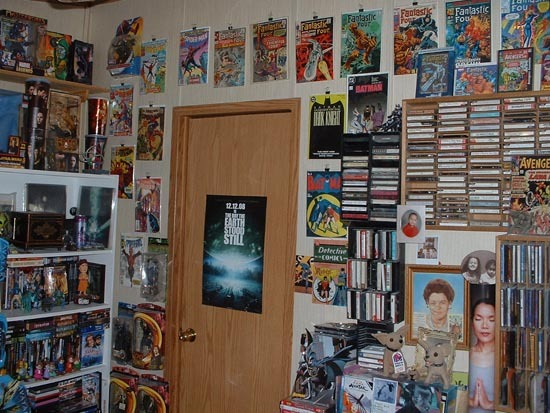 nice room Paul were are the Star Wars posters? And Austin you got a nice start nice going kid! 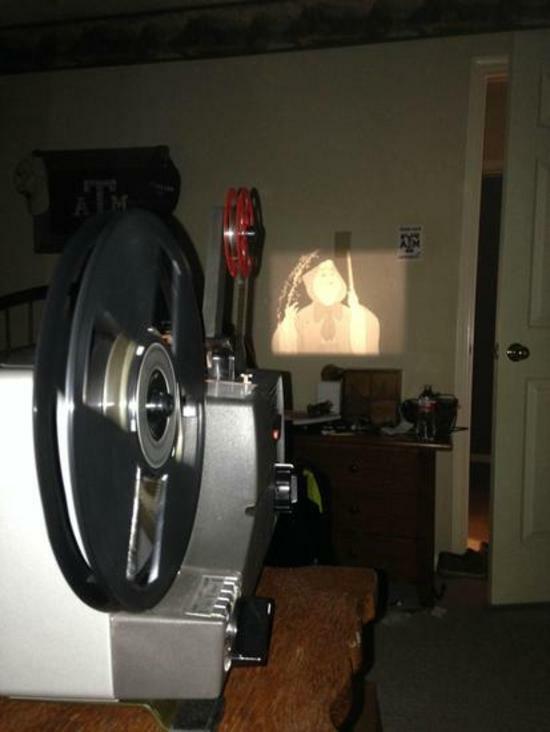 My projection room is shiftable. living room or little office or on the road. 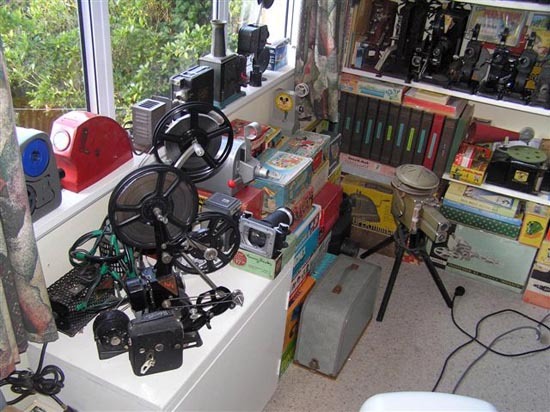 Here are the projectors I use, B&H Filmo Regent 8mm, B&H Filmo Diplomat 16mm, Bolex 18-5L Super8, Elmo Sound St800 Super 8, Bolex M8 Standard 8. 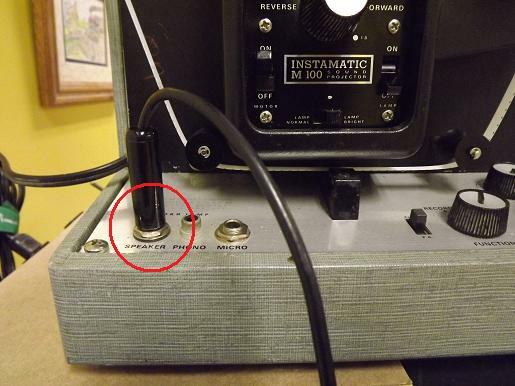 Also a B&H 285 16mm with amp sidelined. 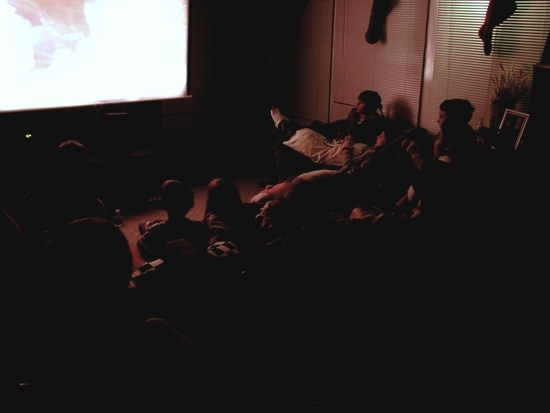 I've been very fortunate to have a place made available to have regular film screenings here in Berkeley. This is normally an office so, my set up is simple and portable. Today, I took a few pictures to show you what the room looks like when you come to see a film but most importantly, how I run the sound out of the projector. 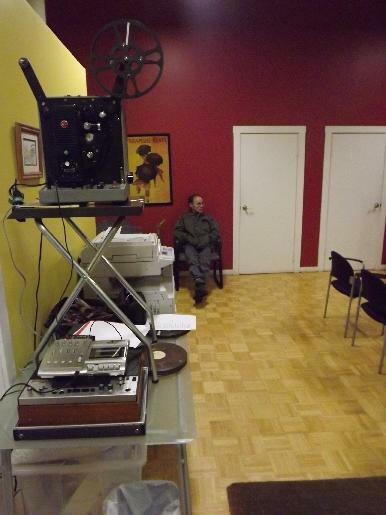 The speakers were found on the street then, donated to our film club! As you can see, everyone has a great time when the sound can be tweaked so you can hear the dang song in the film! This is really a simple and portable set up for film projection and I've been doing it for a while since I got the DI box, it really helps minimize noise and feedback from grounding issues, especially in an old building such as The Tannery. Looks great Vidar! I like the white shelves...looks like a cozy film room. Can't wait to see the pics Roger! 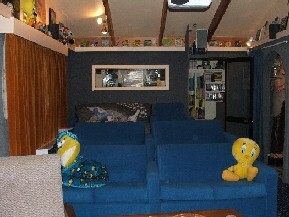 So here are the Upstairs Home Theater Pics as promised. We finally figured out how to resize, load and add them to post. Hope you like them! 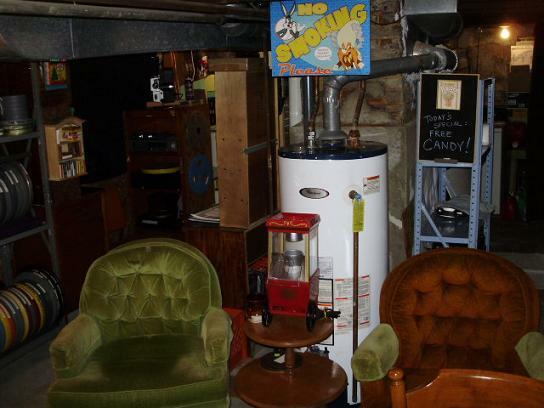 Screen shot with vintage Laurel & Hardy statues and kettle popcorn maker in RH corner. 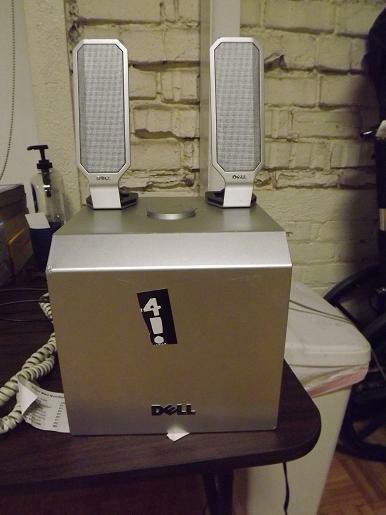 Polk bookshelf speakers on pedestals. 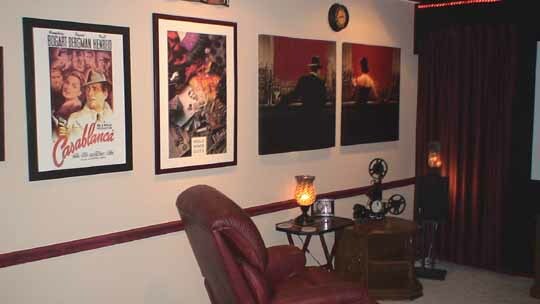 Shot of the other wall, note 35mm film reel clock with 16mm hands. Clock works, the hands and numbers glow in the dark. Table is film editing station. Roger...class man! Lookin'good. 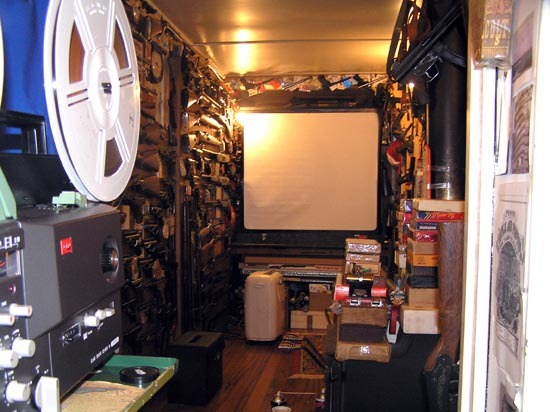 I want to un-clutter my cinema and make it more like a theatre. 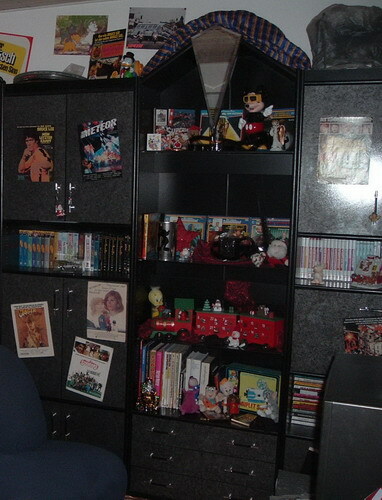 It's my work area and where I store my collection so I am use to it being...cluttered. 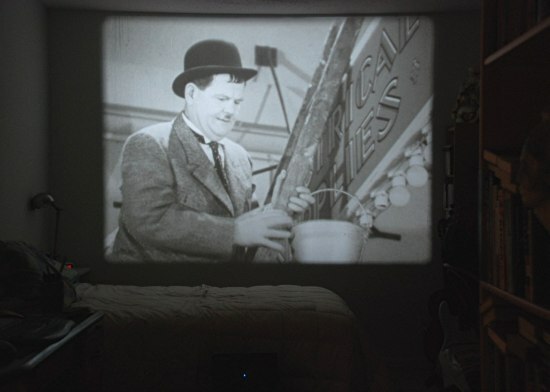 It's a nice set-up and I have the same Laurel and Hardy statues. They are at least 40-43 years old and I got mine new. Terrific Roger...!!!! 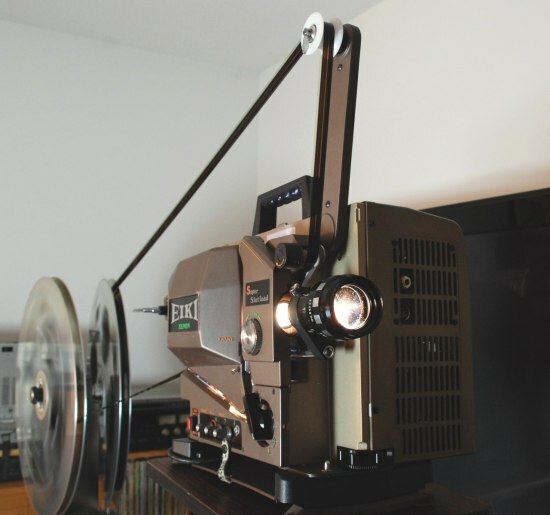 What are you using for a projector stand? Oh thanks Jan for your nice comment! Yes I had to really search for the right stand and found for my needs a stereo/audio component rack/stand. It has adjustable glass shelves but you can't adjust the height of the rack so for me it had to be the perfect height so that I could project onto the screen. Oh Jan forgot one thing the top platform is big enough to put two projectors on because I think it was designed for a TV to set on the top. Here are a few pics taken after overhead light baffle was completed. The first two were taken without flash and the last one was taken with flash while projector was running just to show the overhead light baffle itself. The credit really goes to Paul Adsett for suggesting I install an overhead light baffle on the ceiling. It does make a big difference in the picture quality and picture contrast for both color & B&W. The baffle is that black something on the roof? Some cloth perhaps? I use black cloths on the floor and this reduces glare from the floor. Very nice room Roger, Heaven! Your acreening room is in the general of heaven too ..... "upstairs". 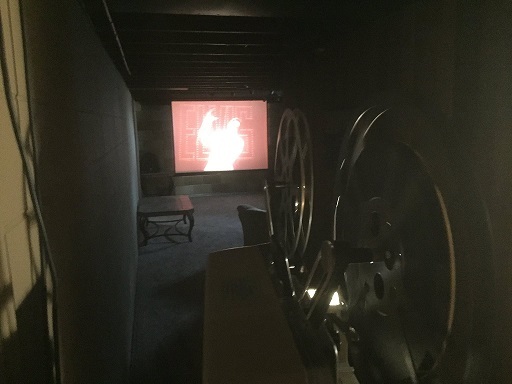 So screening rooms in the basement are in the general direction of the netherworld. Yeah Akshay, Thanks for your comments. This is in our upstairs loft! I suspended 2 wooden panels from the ceiling and stretched black cloth over each panel. The panels extend about 4 feet from the screen and what this does is kill the light from the screen from bouncing off the ceiling and then back onto the screen and killing the picture contrast. It really does make quite a difference in picture quality, and it really has to be seen to be believed. Paul Adsett is the one who talked me into doing this and I'm sure glad he did (thanks paul) because before installing the light baffle the scattered light was washing the pix out. I highly recommend everyone doing this if you really want to improve the picture quality! Looks like Roger has done a great job with that light baffle. Since I first installed my black baffle right over the screen, just as Roger has done, I went on to add a few more. What I found, probably not suprising, is that adding additional panels only effected a slight improvement. In other words 90% of the improvement in picture quality is achieved by that first large black panel right over the screen. You can obviously add more panels if you wish, as I did, but do'nt expect the kind of dramatic improvement that you get with just that first panel. As you can see from the photo, once I got about 4 feet back from the screen I started mixing burgundy panels in with the black panels. At this point it was done mainly for decorative and room ambience effect. Thanks Paul mine only came out the way it did is because you gave me excellent detailed instructions on just how to do it so all the credit goes to you my friend. I just wish mine looked half as good as yours does. My wife really likes your choice of burgundy & black colors blended together and I also have to give her credit for helping me out on this project because without her help it would not have been possible. Thanks Roger. The beautiful thing about this hobby is that it never ends and there is always something you can see to do to make it better and more enjoyable for family and friends. It is an ongoing project. 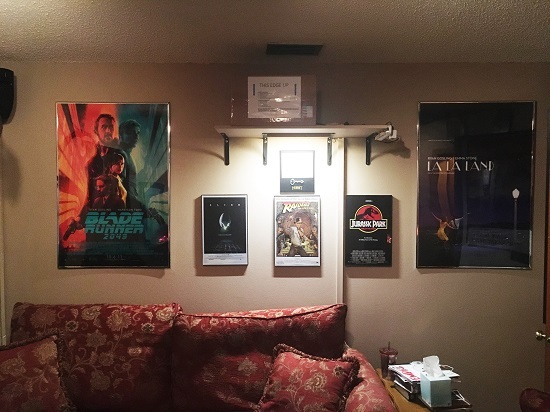 My screening room was started from scratch 9 years ago after a hurricane damaged our house, so I keep doing something to improve it whenever I feel like it, and whenever I think I have a good idea.Little touches really add up to create a great cinema feel. I now have it to the point where it is a daily joy to go in there and kick back and watch my kind of movies. 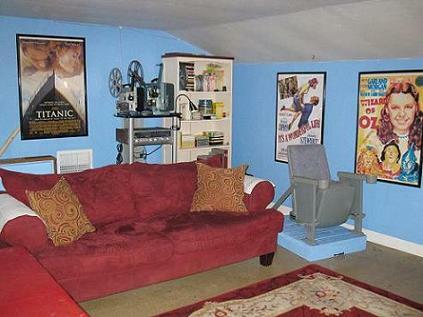 The best of luck with your own home cinema Roger, I am sure it will bring you endless joy. Looking really good guys! Thanks Akshay, I guess I'm in the netherworld! 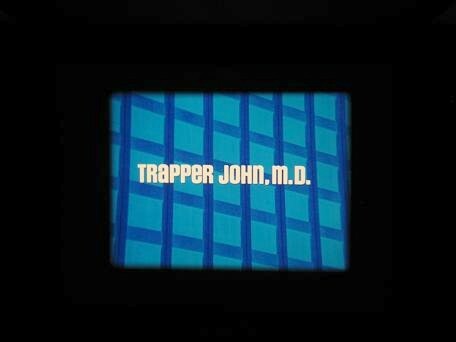 Nice print of Trapper John...I have an episode in 16mm and it looks as stunning as yours. Good show. Ha ha .... Bill, I guess only your screening room is in th netherworld. Spare a though for me, my housing situation is a basement! OK it doesn't look like much but technically I can officially now call my condo a screening room. My wife finally agreed to let me mount a permanent screen instead of me having to setup and teardown the tripod screen anytime I want to watch something. PLUS I got to go from a 6 foot to an 8 foot screen so i can now enjoyably watch scope films...Hmmmmm now what should I watch first. Nice, Dino. I have a similar screen installed. I'm presuming that yours folds upward. Once collapsed they are totally unintrusive. So, nine-five film shows every evening now Dino? Michael yes it rolls up, and once I paint the metal brackets I used to fasten it to the ceiling it will blend right in when not in use...I am trying to convince my wife to let me install motorized masking but she is not going for it, maybe next year....And yes Paul the 9.5 will be alive!!!! Nice set-up Dino way to go! 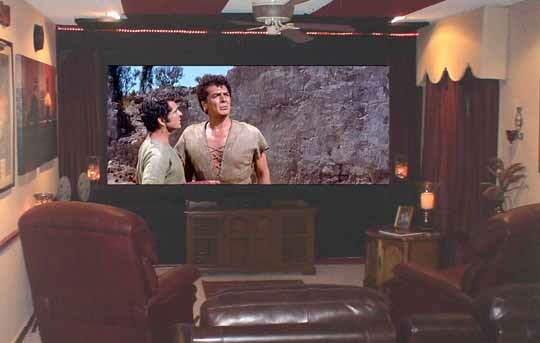 Since I got mine set up my wife is now complaining that I'm spending way too much time in my screening room and not giving her enough attention! Yeah Graham what's a guy to do? Ok Dino thanks for the advise I will have to get a few of those to keep the wife happy! 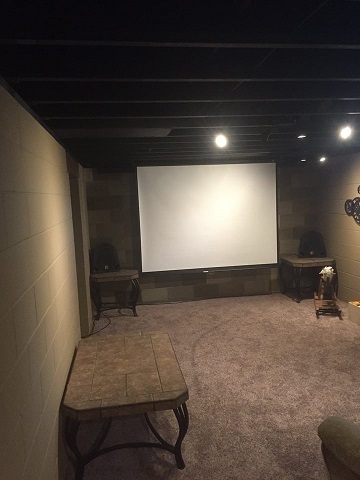 I recently moved to a new house and had the oportunity to custom build a new theater room. Too many pictures to post here, but belw is a link tosee the construction. Enjoy! That's a dream showroom to most us on here Adam and certainly for me! How hard can it be to pick the right 6 numbers!! Ha ha. It's awesome Adam looks like you put a lot of hard work & effort into this project and the results are stunning! The private booth is a nice touch and I bet you really feel like you are at the movies now! Adam...that's brilliant, I like the idea of the curved screen and your VP matches in with the color of the ceiling. Waw ! I have just a screen on the wall, so I am very admirative. Thanks guys! It was really an awesome opportunity to create exactly what I wanted. Plus having a wife who lets you do this makes me feel like the luckiest guy in the world! 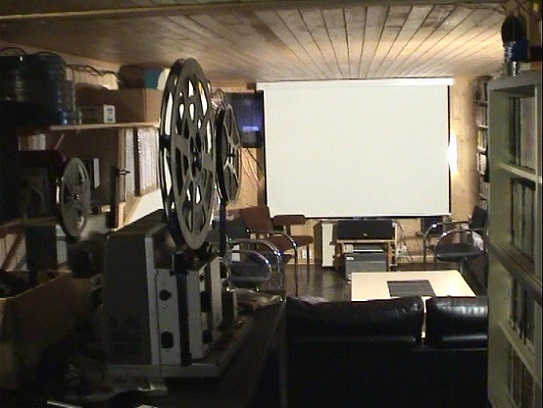 Some amazing screening rooms people have. Our climate here is Australia lends itself to an outdoor setting, I have set up our motorised 4.2m screen in our courtyard shooting from my studio/bio. I can run Super8, dirty digital, 16 and 35. On screen a little digital "Raiders" for my fencing club just before Christmas. 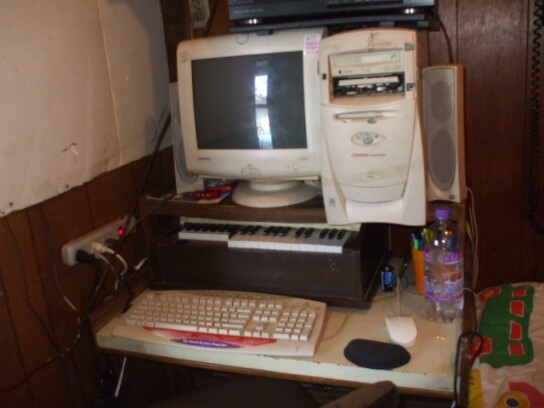 Ross...your setup is awesome! Thanks for the pics. My film shelf. Not all my films, but it is most of them. Hey, atypical user here. 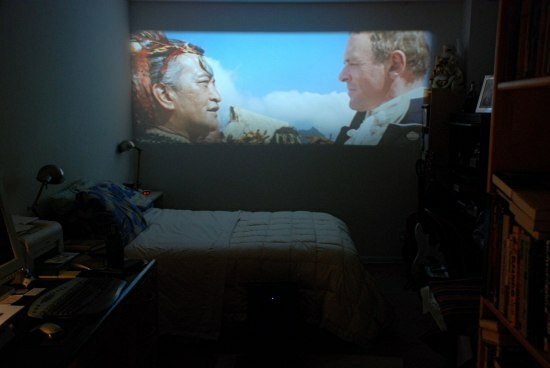 College kid, living with my parents- just learned I'm addicted to film projection recently. My screening room is, well, my room. XD Thought I'd throw a little 'shabby' into the mix here. 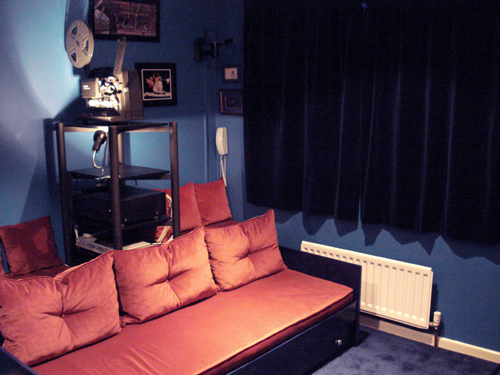 XD My screening room is, well, my room. 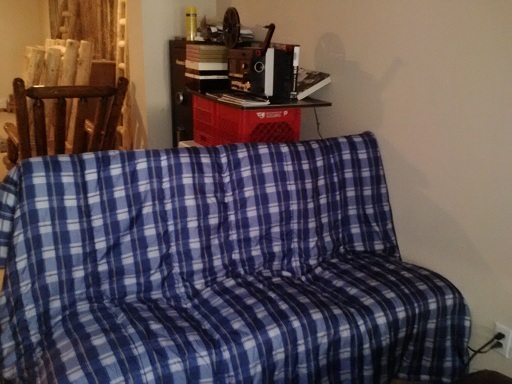 I use my wall as a screen, and my stand's a side table on a footstool. 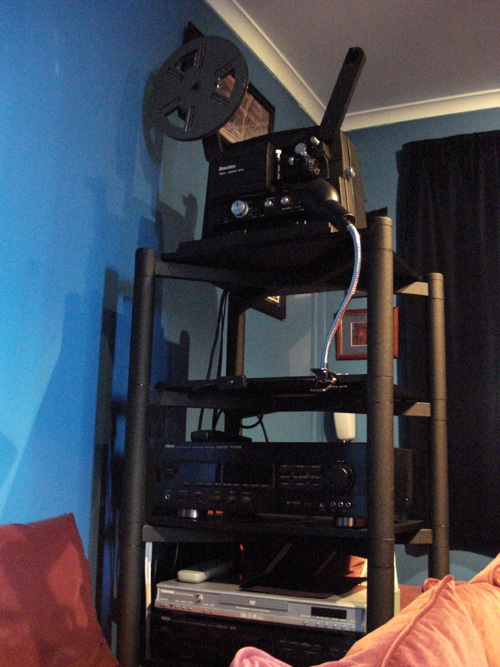 My projector's a, far as I can tell, 'new' Sankyo Dualux 2000H. Found the projector in my grandparents' closet cleaning it out, with a 1982 receipt and all the packing materials. Hope to get a better setup soon, but figure I'll share for the sake of a little perspective. Nice Ronnie....every person on here started just like you! Oh no Bill, you are wrong, in my case it was using far more humble equipment than this! complete with 2 B/W silent 50ft excerpts. A whooping 6v lamp and 200ft reel capacity!! 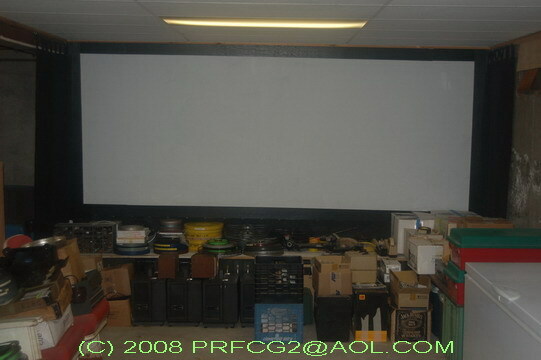 That is a nice projector to start with but I was talking about equipment handed down and having the wall as a screen. Everyone starts somewhere. 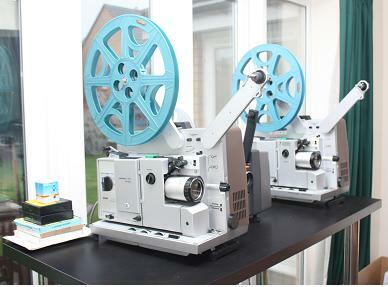 I remember that projector in Kay's catalogue many years ago - always wanted one! 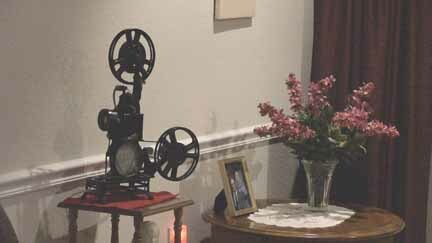 My first was a hand cranked that used b/w silent Disney clips...bought from a catalogue about 1971...it projected a weak picture but was fun. I would say the clips where about 25ft long..back in the day for my family most things were bought on weekly payments from catalogues like Empire Stores or Kays's..
Yep, that's how it was is our house circa 1976 Mark. Now who remembers Cherry Bs, Babycham and Egg Filp at Christmas in that era. Great times mate...especially poring over the winter edition of the catalogues...christmas stuff! 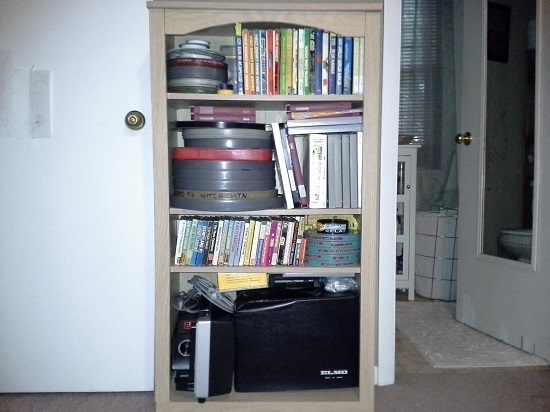 My screening room is really just my bedroom...or living room..or wherever there is enough room to put up the screen, but I did finally get around to (somewhat) organizing my fledgling film collection. Fabulous John, and looks a lot like my own arrangement for my films! It doesn't matter one jot how you enjoy em, just so long as you do! 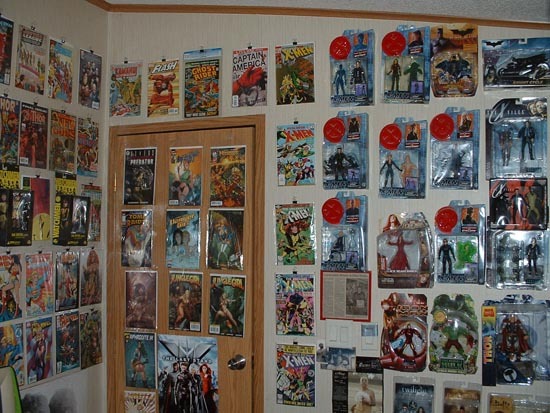 That's still a nice sized collection BTW in my book. Here's my contraption to deaden projector noise. My kitchen is my projection booth. Even more clever! No Jacket Required! E mail it me Kevin and I will put it here if you like. Hey Doug, thank you. Yes Andrew, that Bauer is quiet, but it's a lot of fun behind the wall, looking through a viewhole. Hello! 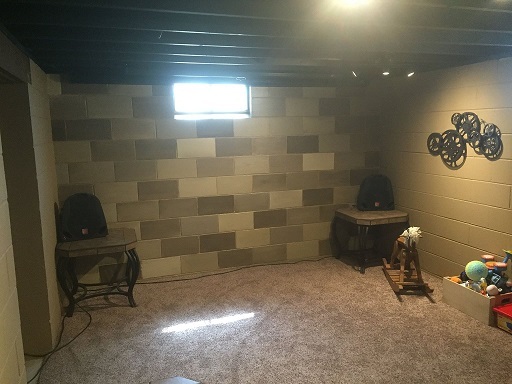 Well, on a very tight budget, I managed to turn our unused basement into my new home theatre (/kid's playroom)! Initially sold the idea as a playroom for the kids, then it just kind of quickly evolved. Couldn't drywall myself (I can hardly operate a screwdriver), but did the best I could with the space on a tight budget. Mounted a pull-down scope screen with a regular screen in front of it (my wife hasn't noticed the scope screen yet). 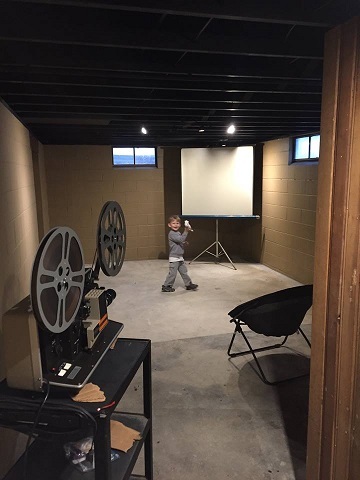 The kids love the new playroom, and Dad loves his new theatre! Michael, we can't see your FB photos unless you friend us all, and would love it if you'd just put even one here. Sorry, I thought I'd set that portion of facebook open to all. Very excited to get this project done! Sorry if this is too many photos! Too many photographs?...Impossible, no matter how many. Everyone here loves to see all the photographs that are shared here, I know I certainly do anyhow! We should get together sometime and hang out...I live in Massillon. Thanks guys! My kids and I are down there almost every night, its great! Yes, Bill, would love to meet up sometime - sent you a pm. I love the photos Michael. Andrew is right...you can never have enough pics. 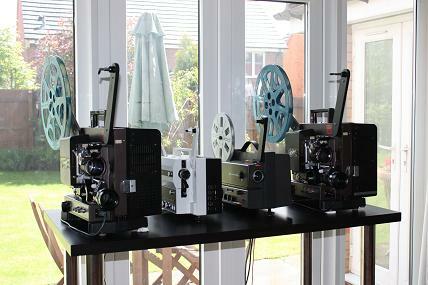 I like that you are displaying some of your projectors too....very nice! 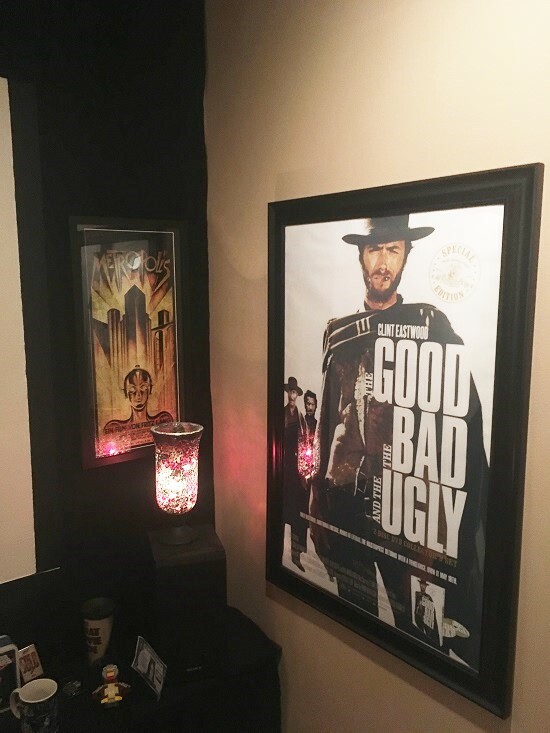 I'm still adding little touches to my screening room. Now I can imagine that I am back at the Windsor Kinema when I watch my old classic movies! What a great screening room. I'm so jealous! 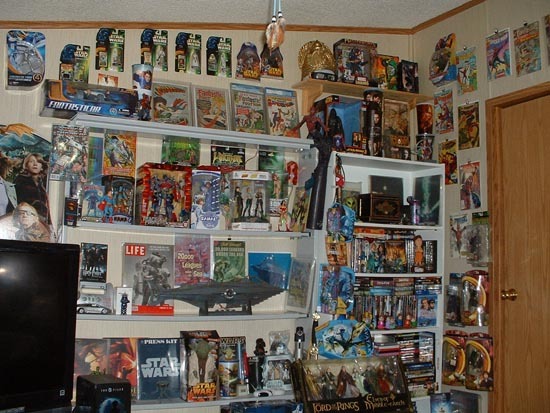 ....And I'm so jealous of your 'Closet O' Films' Doug! Thanks Doug and Andrew for the nice comments. Much appreciated. 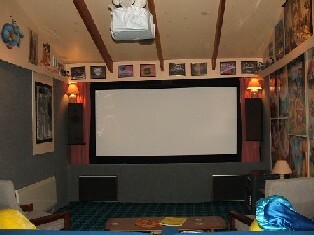 Here are some Photos of my little Home Cinema. 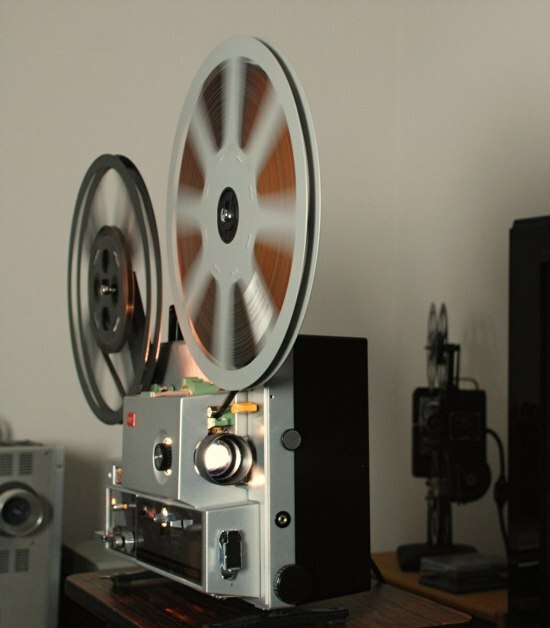 I can play Super8, Standard8, 35mm, BluRay and BluRay 3D. What an amazing job you've done. Incredibly impressive! That is a semi pro setup. Do you maintain your machines yourself? The 35mm ones. 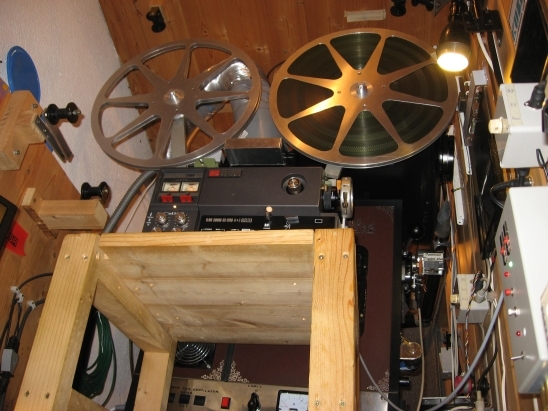 The 35mm Machine is a mobile one from the 1940´s. The old Woodcover I changed to a new one in 1997 put a 400W Halogenlamp and Stereo Cells in. It runs very well over the last 20 Years. Thomas, your theater is awesome! Can I live there? 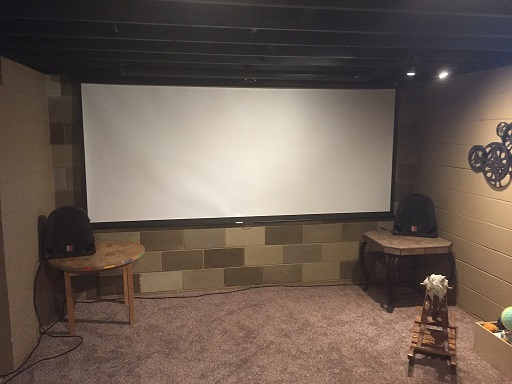 There are some very nice home theater build-outs on this thread. Maybe in our next house...? 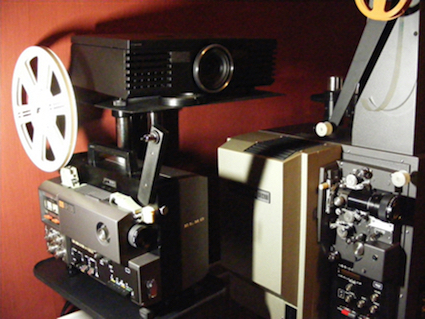 What brand of 16mm projector is in the picture and what is the film capacity of the machine? 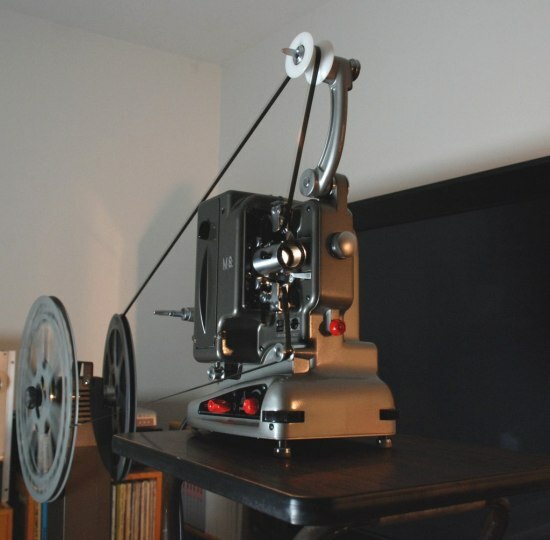 The 16mm machine pictured is the Elmo LX2200 pedestal machine. It takes large capacity spools that are either 5000 or 6000 feet. I haven't tried a load that big yet. I have large Eiki spools that are unmarked for length but I believe are 5000. The machine produces great pictures but I have had to have two PCBs in it refurbished recently at some cost to get all the functions back. Now it is fully functional so I'm inspired to make further improvements to the room! 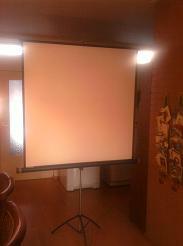 The digital projector is an Epson 3100, which gives a superb picture, and is capable of 3D projection. The 5.1 surround sytem includes a Yamaha RX-V383 A/V receiver, three front Sony Core speakers, and two rear channel Bose surround speakers, and a Sony active subwoofer. He has done a great job with wall cinema art.